Here below all Swedish orchids are presented. I have choose to do this presentation in a strictly alphabetical order using the Latin names, not according the order commonly used in floras where the scientific system for plants is used. 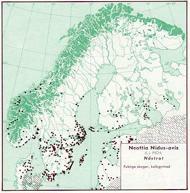 As for nomenclature, I have used Mossberg / Nilsson: Den nya nordiska floran (The new Nordic flora), regarding both the Swedish and Latin names. Each species has a brief description and a picture showing what the species looks like. There is also a link to the image gallery for this species in case you want to see more pictures. 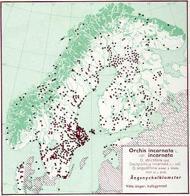 In addition there are, with the permission of Naturhistoriska Riksmuseet's (the Natural History Museum's) website "The virtual flora", maps showing each species' distribution in Scandinavia. Clicking on the map will open a slightly larger image directly in the NRM's website. For those who want to know more about the actual species are advised to read further on "The virtual flora" (Swedish) for further information on the species. 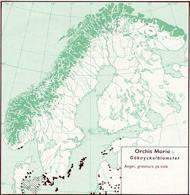 Orchids can be found over almost the whole of Sweden. However, many are tied to specific environments and are then often very local and rare. 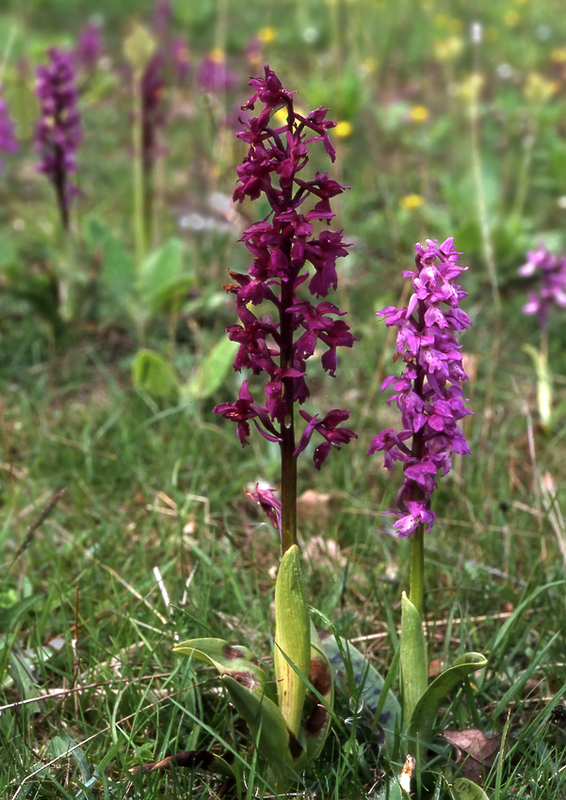 Several of our orchids are here at the extreme northern limit of its distribution and grow here only in specific environments, although they further south in Europe are growing in different environments. Orchids in Sweden are all perennial herbs. 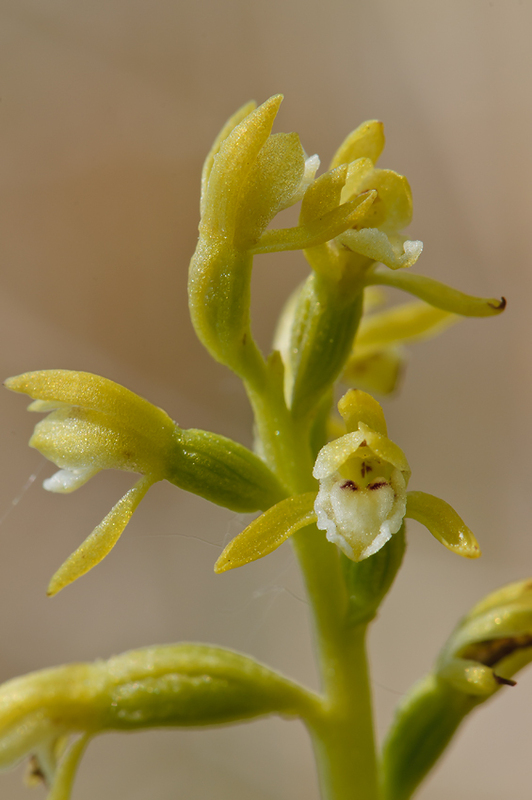 All, like all European orchids, are terrestrial. A few are saprophytes, which mean they live underground and only send up a flower stalk to set seeds. - They are all monocots. - They have no loose pollen; the pollen is gathered in clumps that sit on a "shank," pollinia. - All are pollinated by insects (to some extent self-pollination occurs ). - The flowers always have six petals and have an unsymmetrical shape. - The seed capsules burst up after markings on the sides that go from the base to the top and the seeds are then spread by the wind. - The seeds are microscopic and often in thousands in each seed pod. - Since the seed is lacking endosperm, it has to meet a fungus partner to be able to germinate. 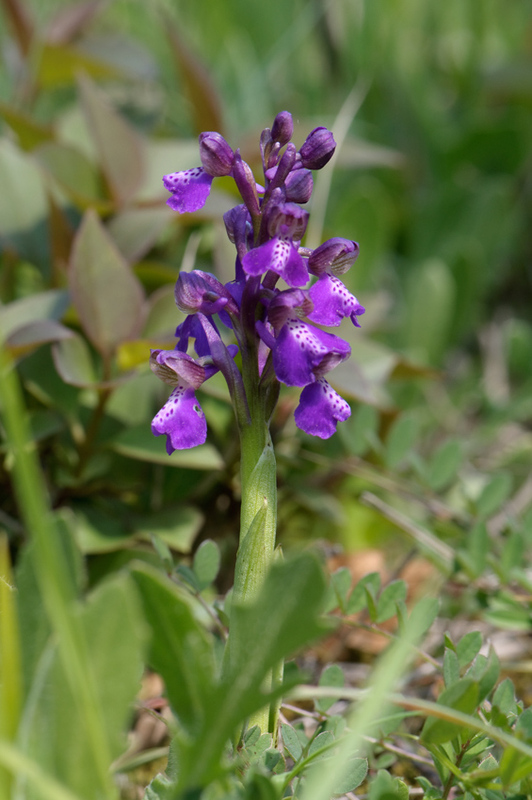 Green-winged Orchid is growing in Sweden in Skåne, Öland and Gotland. 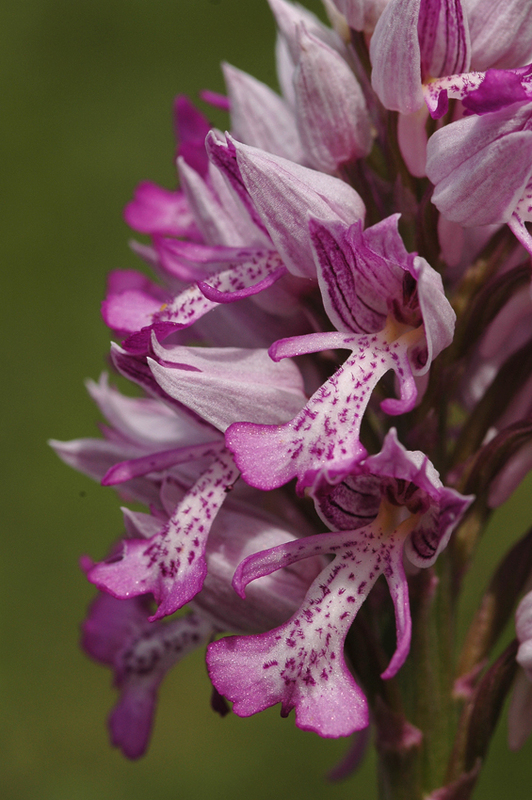 Following recent findings in orchid research, this species have been moved from Orchis to Anacamptis. It is a robust plant with usually a dense spike. The flowers are usually purple, but can vary greatly. The sepals are green veined. The lip is broader than long and has from the thick spur onwards a white center with red spots. It is slightly three-lobed and side lobes are folded down. White color forms occur. A. morio has a very large distribution area, covering most of Europe and eastwards to Iran. To the south, the limit is unclear because confusion with A. picta which in some areas completely could replace it. The species has declined almost everywhere due to improvement in agriculture. Flowering: May-June. Anacamptis palustris is in Sweden only known from Gotland. This is also the northern limit for this species. It is a slender plant, 20-40 cm, and the inflorescense is quit lax. Leaves are narrow and erect almost grass-like. The rather large flowers are pink to pale purple. The lip is weakly three-lobed, has a whitish center with purple dots and streaks. Rather long and thick spur; near horizontal. Habitat: Open calcareous bog and marsh-edges at a few sites at Gotland. Distribution is Europe, eastward to Anatolia (Turkey), but throughout its range, it has declined strongly due to drainage of wetlands. Locally, however, it may be common. Flowering: July. 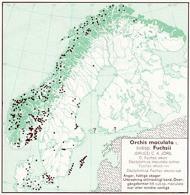 Only sites in Sweden for Pyramidal Orchid are at its distribution area's northern outposts, Öland and Gotland. The species names in Latin, is received from the pyramidal shape of the inflorescence, especially before all flowers opened up, it is very conical. Later on it got a rounded shape. The flowers in the very dense inflorescence are small. The spur is long and thin, in the spur mouth there is a rib on each side which helps to control the nectar applicants butterfly proboscis right. The lip is three-fold, but the shape of the lobes can vary significantly between different locations. This is also valid for the color that can vary from dark lilac to pure white (alba-forms) and a number of names are given to this different variants/forms. Plant height 20-60 cm. Habitat: Usually poor grassland, old pasture and arable land, meadows and open forests. Distribution: Almost the whole Europe. Flowering: July. The name, Calypso, is from the Greek mythology, named after the beautiful nymph Calypso, daughter of Atlas. The species name, bulbosa, refers the root. The plant have a stem with a singel flower, at the base there is a oval, pleated leaf. The stem is at the lower part surrounded by some brown sheaths and has at the top a pink/red bract. The flower is pink except for the lip that usually is white or light pink. The base of the lip is cup shaped and streaked with purple inside. This extending forward to a two-lobed, yellow spur. Grows in damp mossy and not too dense coniferous forests. Flowering: June or July due to snow melt. In Sweden the White Helleborine can only on be found at the island of Gotland, which is a northern outpost of this otherwise South and Central European species. The wide rather short leaves gradually shifting to bracts that are rather dominant in the lax inflorescence. The flowers (3-15) are yellowish white and opens poorly, they have a lily-like appearance which is also seen in the Swedish name (big forest lily). The epichile is yellow at its base. This species is regularly self-pollinated. Grows usually in mid-shade to shaded areas on dry, calcareous, coastal woodland. Distribution is most of Europe and part of Asia, but everywhere quite rare. Flowering: June — July. 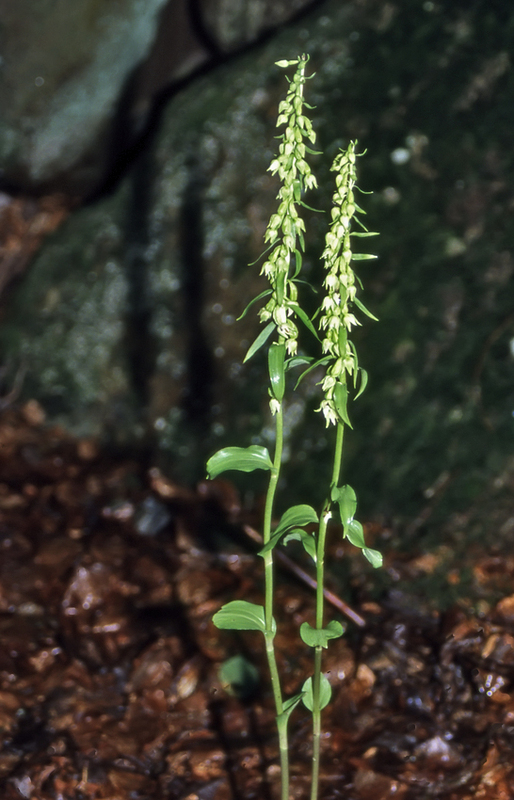 Swedish name of Sword-leaved Helleborine is "white forest lily" (Vit skogslilja). 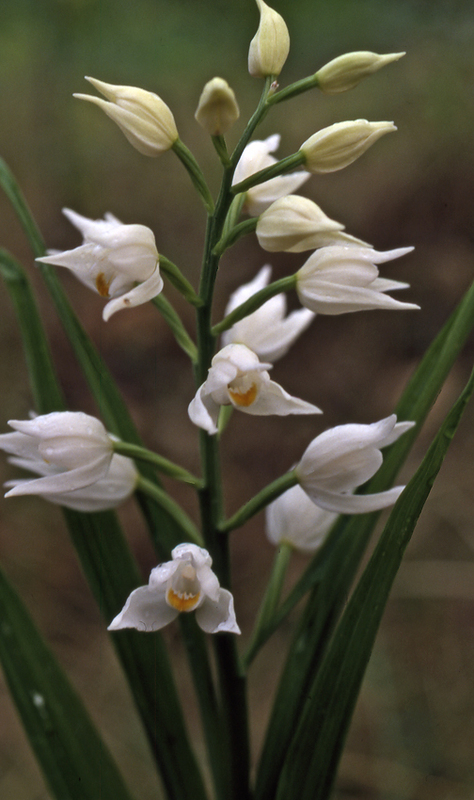 it differs from White Helleborine through the large number of flowers (8 — 30) and longer and narrower leaves. The bracts are also smaller. The flowers are pure white with a yellow tip on the epichile. The inflorescence has a larger and more stately appearance. Usually the flowers are whiter than those at White Helleborine. Habitat is open woodland and sometimes moist grasslands. Occasionally when Sword-leaved Helleborine is growing together with Red Helleborine hybrids between them can be found. Since Sword-leaved Helleborine can tolerate different environments it seems to be somewhat favored by today's farming conditions. In Sweden, outside Öland and Gotland, Sword-leaved Helleborine are mainly found along the east coast with only a few inland sites. Distribution is Europe and the temperated zone of Asia. Flowering: June. 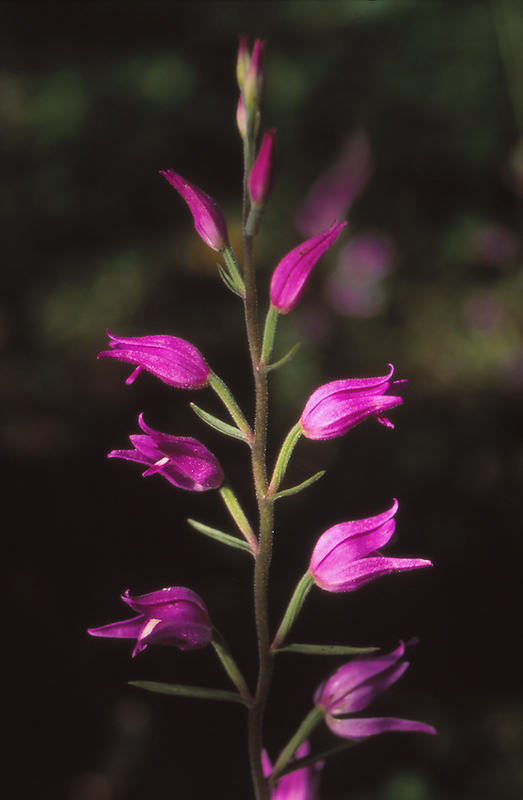 Red helleborine is the third of the Swedish native helleborines. It is unlikely that any confusion with other species can be done, due to its unique, large, red flowers, although there are reports of white flowering specimens. C. rubra is a stately plant that can grow up to 65 cm and have 10 or so flowers. The rose-red flowers open usually much more than C. damasonium and longifolia. The pointed lip has a white field with yellow streaks. At overgrowth C. rubra can survive underground for years and return when conditions become favorable again. In Sweden the species can be found in some provinces north to Värmland. Best known area for this species is Gotska Sandön. Hybrids with C. longifolia are rare but can be found where the species meet. Distribution is Europe and the temperate part of Asia. Habitat is usually dry, open woodland, mainly at lime. Flowering: June-July. This is a monospecific genus, were Alpine Chamorchis is the only species. The name, Chamorchis, derived from Greek and refers to the low growth mode. It also makes the Swedish name for this, "dvärgyxne" it is a really miniature orchid. Usually it will not be more than 5–6 cm high. The small flowers, usually only two or three but may be up to 10 or so, are green with a tinged of brown on the helmet formed by petals. The lip is yellow / yellow-green with a hint of three-way split. The distribution in Sweden is the mountains of western Härjedalen and north to Lappland's northern mountains. Otherwise, it is in the Norwegian mountains and also in southern Europe's alpine areas where you hardly find it below 1500 m. Habitat is calcareous, alpine areas, Dryas heath, rock terraces. Flowering: July to August. 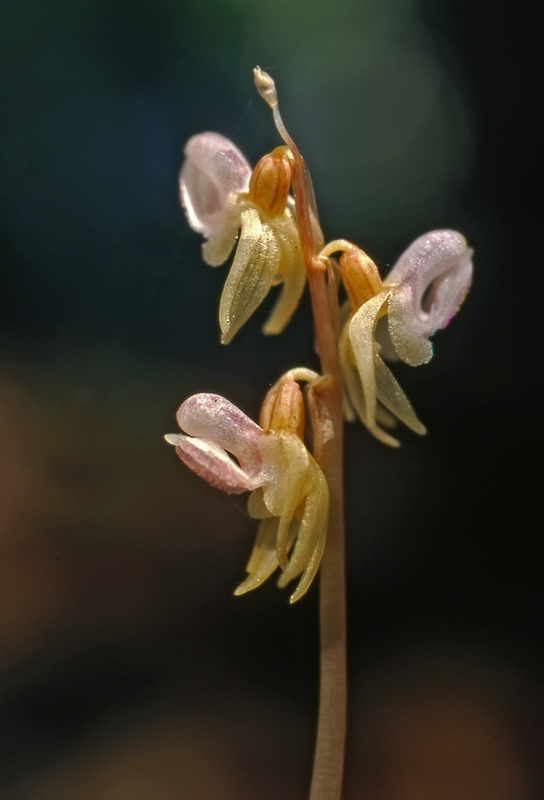 Coralroot is also the Swedish name of this tiny orchid. It is the root that gave it its name. It looks like a coral with all their short branches. Coral root is a saprophyte and has none green leaves, but live in symbiosis with a fungus that gives it the nutrients it needs. It is only visible when it's time to flower and set seed. Flower stalk is 10-25 cm and is surrounded by brown leaf sheaths. The inflorescence is lax and carries up to 10 or so small, yellowish-green flowers. The lip is white with some red streaks. 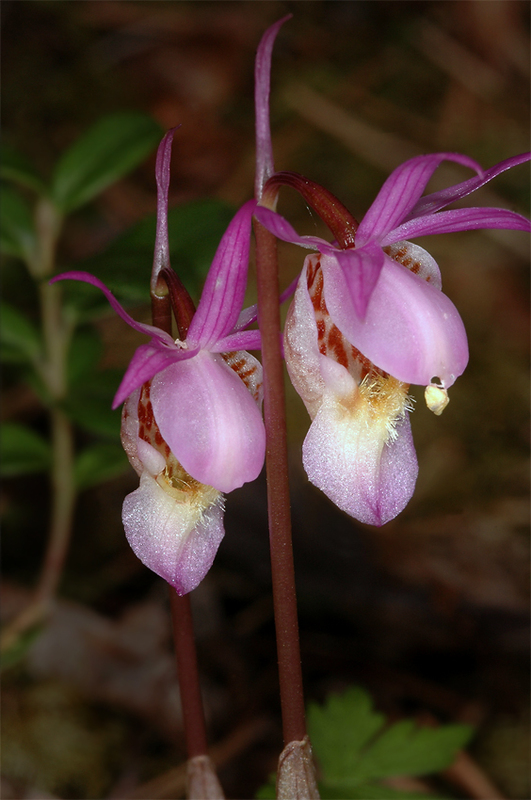 Coralroot can be found in almost the entire country. It grows in moist, shady woodlands under bushes, in alpine wetlands grows it quite openly. Overall distribution is the Northern Hemisphere coniferous forest areas. Flowering: May-June. Lady's slipper is probably familiar to most people. This is the one of our orchids that have the greatest flower and perhaps the only one who can compete with the tropical species we usually grow at home. The Swedish name "guckusko" comes from an old dialect name, "gucku" , meaning cuckoo and probably have the connection made ​​since it blooms during the time when the cuckoo gal. The Latin species name, calseolus, means "little shoe” and refers to the lip. 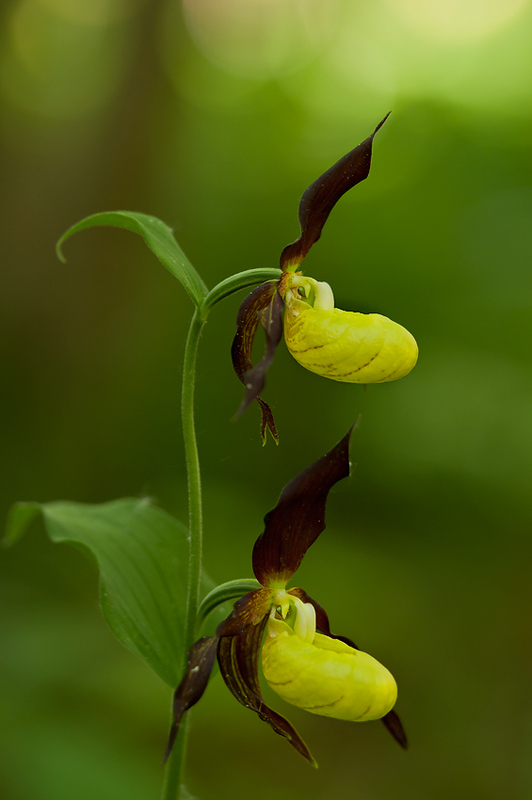 Lady's Slipper belongs to a group of orchids that are considered more primitive than others. It has for example no pollinia, the pollen is gathered in an anther on each side of the stigma. The large yellow "shoe" is the lip that has turned into a trap for insects that only can get out through openings at the base of the lip. There, they will past the stigma first and then the pollen masses before they come out and get away with pollen to the next flower. Other sepals and petals are brown. Petals are long and thin and usually twisted. They are stately plants that can reach a height of up to 70 cm. Each flower stalk bears 1-3 flowers. 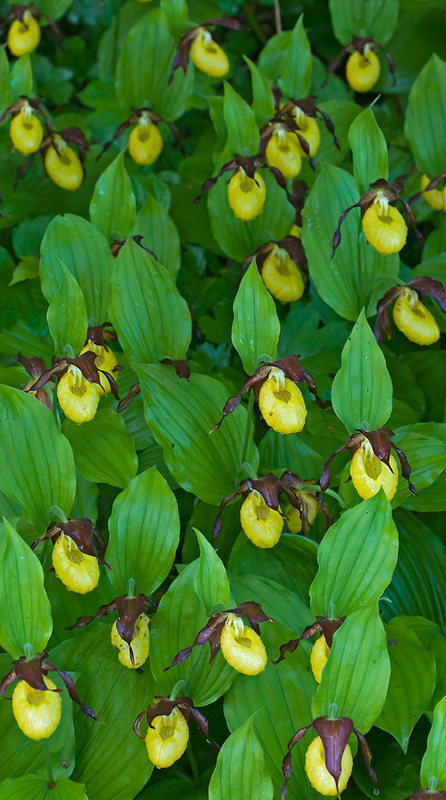 Lady's Slipper often grows in dense groups making the overall impression even grander. In Sweden you will find Lady's Slipper mainly from Väster-/Östergötland and northward, only in limestone areas. Flowering: Late May to July. 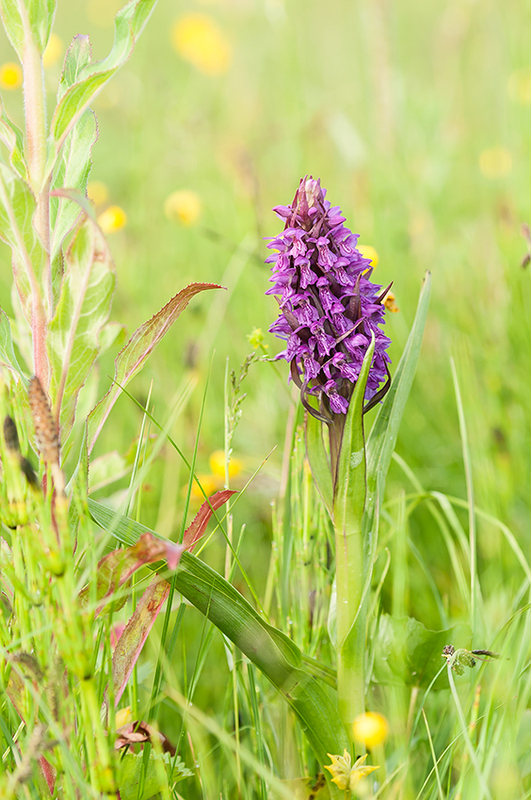 Common Spotted-orchid normally reach a height of 30-60 cm. Leaves long and narrow, spotted, lowest leaf with rounded tip. Conical inflorescence. Purple-lilac flowers with darker streak and dots on the deep 3-lobed lip, mid lob as big as lateral lobes, which is the character that most easily distinguishes it from D. maculata. Grows, as the Swedish name "skogsnycklar" suggests, in open forests and forest edges, but you can also find it in open pastures and meadows, always at alkaline substrates. The species hybridize extensively with other species within the genus. Hybrids with D. incarnata provide big specimens, sometimes growing in large groups and is an impressive sight. In almost all parts of the country. Overall distribution is unclear due confusion with other related species but with a probable concentration in western and central Europe. Flowering: June-July. 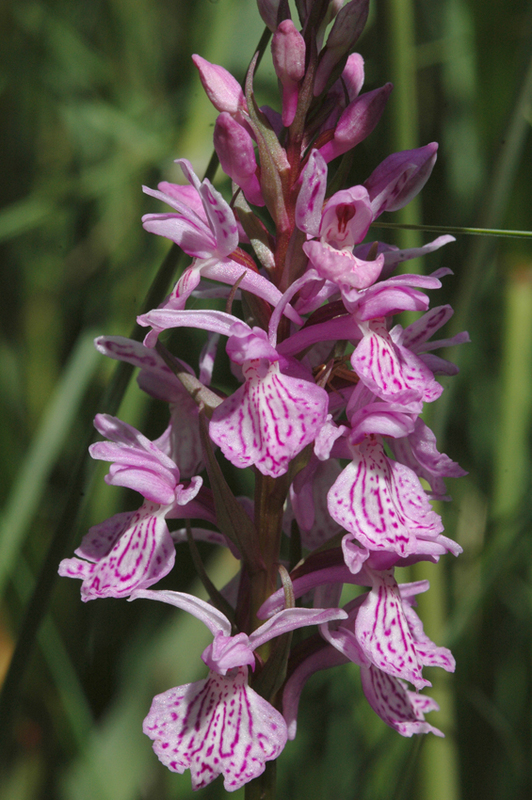 In "Den nya nordiska floran" is this species named as Dactylorhiza maculata subsp. fuchsii. Also in "Checklista för Nordens kärlväxter" D. fuchsii is treated as a subspices to D. maculata. If subsp. psychrophila is a valid subspecies is not entirely clear. Possibly it is only a local variation within D. fuchsii. It is for example not listed in the "New Nordic flora". It's a very small and spindly plant that barely reaches 20 cm in height. The leaves are small and usually spottet. The inflorescence is short and dense. The flowers are pink, usually quit light, with the lip deeply threelobed. The dark markings on the lip are usually few and forms lines and dots. Grows in full sun to partial shade in moist / wet environments at mountain meadows in northern Scandinavia. Overall distribution is uncertain. Flowering: June-July. 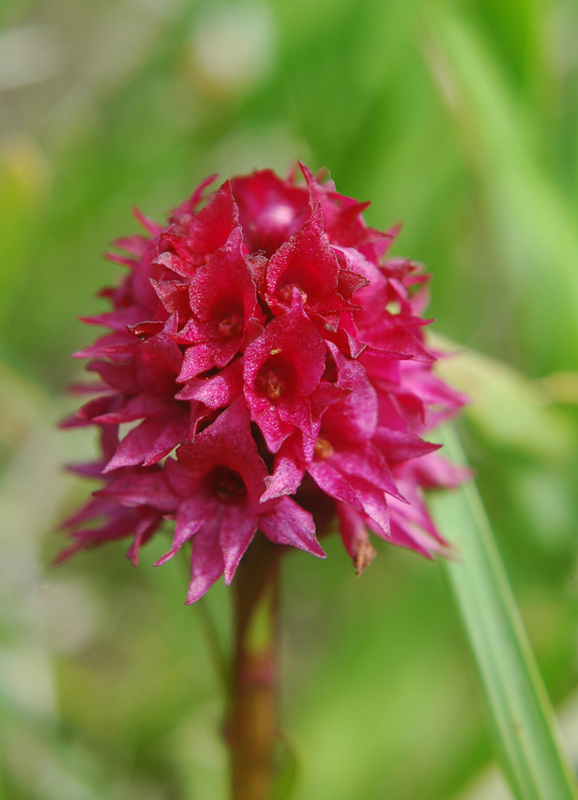 Blood-red Early Marsh Orchid has got the Swedish name “blodnycklar”. The species name cruenta means bloody which both the Latin and the Swedish name refers to, and which come from the strongly, colored spots at the leavs. Sometimes this spots flows together so that most of the leaves turn dark brown-purplish. The spots are also on the underside of leaves and are this is characteristic of the species. Otherwise it's hard to separate this from subsp. incarnata. The flowers are usually dark red. Subsp. cruenta usually grows in marshes and damp, costal meadows within our lime areas. 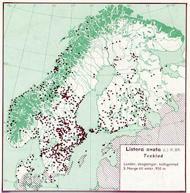 The species is missing in the far south and in the inland of northern Sweden. Total distribution is mainly northern Europe and the Alps where it grows up to 2000 m level. Flowering: June-July. 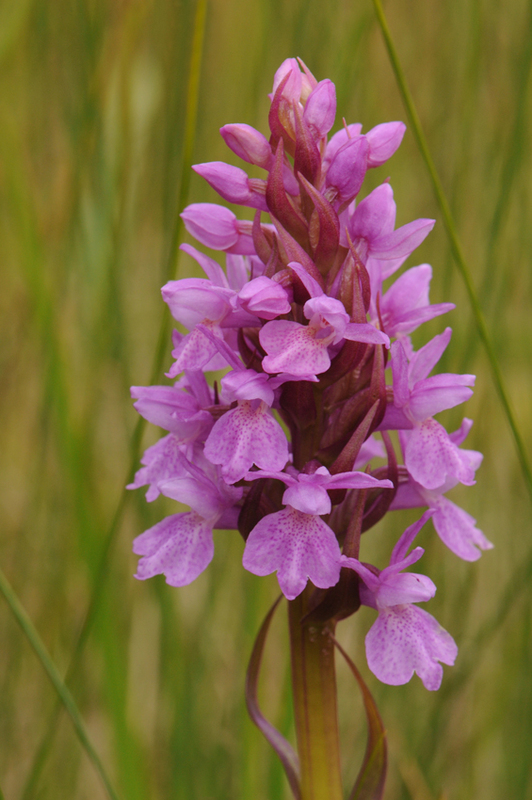 Early Marsh orchid is one of the most common orchids in Sweden. It is a robust plant with rather narrow long leaves up after the whole stalk. Leaves are keeled and upright. The main form has unspotted leaves but spotted leaves exist. Height 15-60 cm. The flowers, quite small, are sitting in a dense cylindrical spike. The color varies from pale pink to dark red-purple, darker markings on the lip. The lip is slightly three lobed with side lobes more or less folded down. 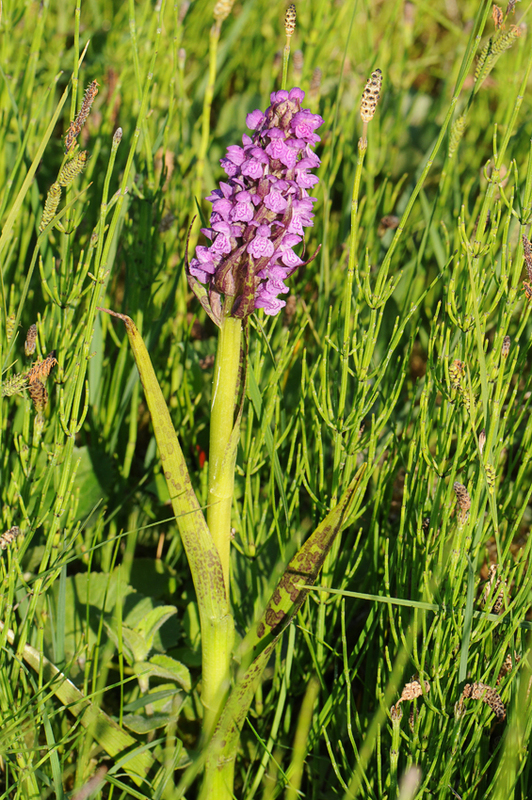 Early Marsh-orchid is highly variable and it through times been described a number of different subspecies, varieties and forms. Habitat is moist meadows and beaches, wetlands and marshes. It is not calcium-dependent but occurs more widely in limestone regions. Overall distribution is Europe and southwest Asia. Flowering: June-July. 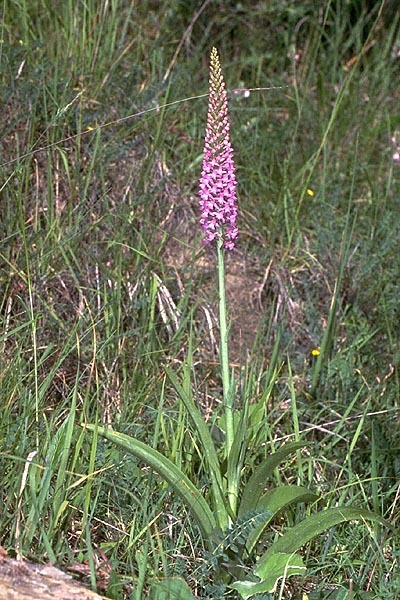 15 Dactylorhiza incarnata subsp. ochroleuca (Wüst-nei ex Boll) P.F. Hunt & Summerh. D. incarnate subsp. ochroleuca lives up to its name. As white candles, they are standing in wet meadows and wetlands, often accompanied by subsp. incarnata. These are not albino forms of subsp. incarnata but a special color form (pure white albino forms of incarnata exist, but are rare). Besides the color of the flowers there are almost no differences between subsp. ochroleuca compared to subsp. incarnata. The flowers are off-white with a little tinge of yellow on the lip. Habitat for subsp. ochroleuca is wet alkaline substrates, especially at Öland and Gotland. Some single sites can be found at the mainland. Overall distribution is, except Scandinavia, Central Europe. Flowering: June-July. Species name lapponica meaning "from Lapland" but its distribution is somewhat larger than that. The species is quite unusual and significant gaps are in their range. It is a rather spindly plant up to 30 cm high. The leaves (3-4) are narrow and densly spotted. Flower stem is usually reddish in the upper part. The flowers, in the rather sparse and few-flowered ear, are usually strong purple. Grows in marshes and other wetlands in Scandinavia calcareous mountain areas. Outside the Scandinavian mountains D. lapponica grows in the Alps limestone areas. Flowering: July. 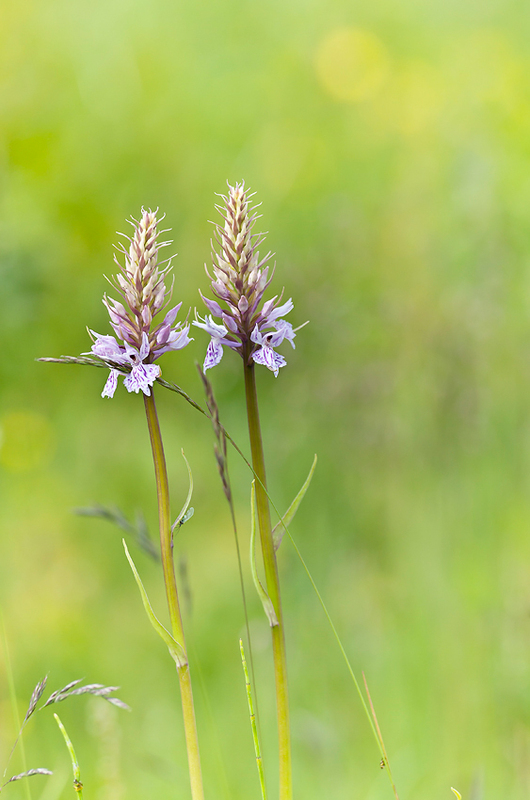 Heath Spotted Orchid, along with Butterfly-orchid is perhaps the most common orchid in Sweden, at least outside limestone areas. The plants, which can reach up to 60 cm in height, have quite narrow, heavily mottled leaves. The lowest leave is quite pointed, a character that distinguishes it from D. fuchsii where the lowest leave is rounded at the tip. More clearly written is perhaps the difference in the shape of the lip where subsp. maculata have a very weak tree lobed lip with a small mid lobe, whereas D. fuchsii has three more equal-sized lobes. 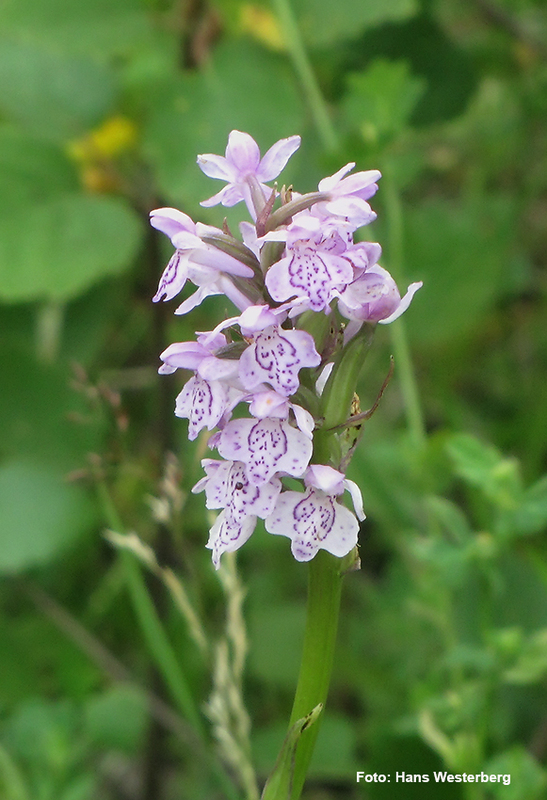 Heath spotted orchid is found throughout the country. Overall distribution is poorly understood due confusion within this group, but the main distribution is in the Northern and Central Europe. Flowering: June-July. In the British Isles this is the most common D. maculata subspecies. It is, however, also found in Scandinavia and possibly in most of Northern Europe. Its occurrence in Sweden is questionable. According latest revision of the Swedish orchid flora it is considered that subsp. ericetorum don’t differ from subsp. maculata in a way that made a separate taxon needed. Subsp. ericetorum can be difficult to distinguish from subsp. maculata, but it has usually smaller and fewer leaves. The flowers often have a larger lip, often quite faint markings. 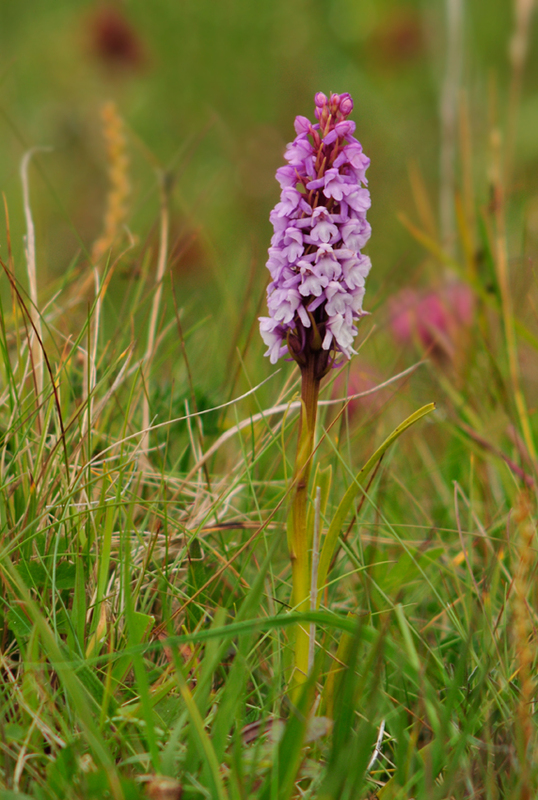 But above all, it grows in so acidic environments that there is hardly any other orchids there, like acidic peat bogs, marshes and other damp or wet environments but also on heathland. The distribution is unclear due to confusion with mainly subsp. maculata. Flowering: June-July. 19 Dactylorhiza majalis subsp. baltica (Klinge) H.Sund. This subspecies is found in one place in Sweden. 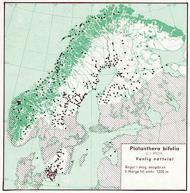 In late July 2004 a flowering specimen was discovered outside Piteå. Most likely, the seeds come with imports of pulpwood from the Baltics. Additional plants have been found in recent years in the same field. Subsp. baltica reaches a height of 50 cm and has bright green leaves with dark spots. Inflorescence often quite long and dense. Flowers bracts usually longer than the flower. Flowers are lilac to pale red and with a clear three-lobed lip with darker markings. Subsp. baltica belong predominantly to Estonia but can also be found in Latvia and Lithuania. Whether this species should be included in the Swedish orchid flora is somewhat uncertain. The future will show whether the species can become established or if it is just an occasional occurrence. Flowering: July. 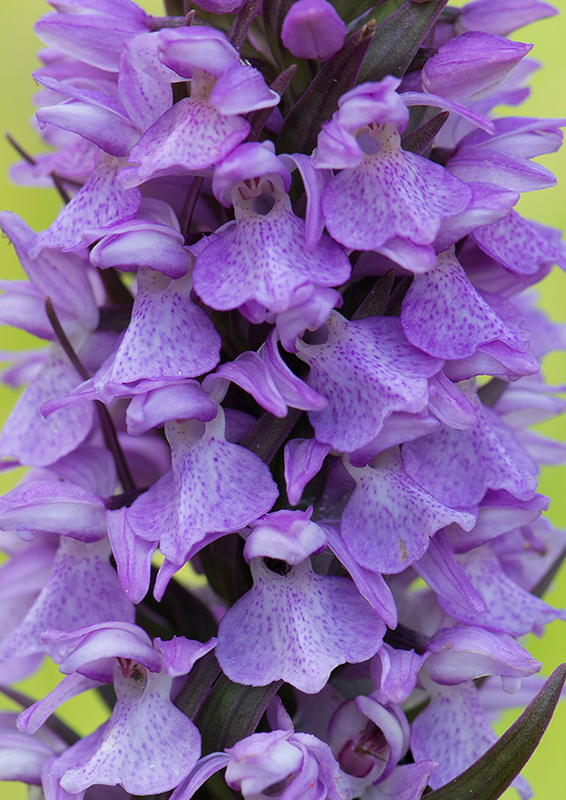 Dactylorhiza majalis is a robust plant, 20-40 cm high. Leaves are large and broad, broadest toward the center and heavily spotted. The dense inflorescence is cylindrical or egg-shaped, flowers are usually bright purple with darker markings. Lip, weak three lobed, is usually spread out, not folded as in D. incarnata. Bracts are longer than the flowers. D. majalis is a part of a species complex and several other species are included in this (i.e. D. purpurella, D. praetermissa). Habitat is often flood irrigation beds, moist limestone fens and similar environments. In Sweden, it is found in the southern parts, Skåne, and a single site in Halland that forms the northern limit. Overall distribution is Northern and Central Europe. Flowering: May-June. Typically, in Swedish this species has been named “mossnycklar”, a name that refer to its habitat. Even the Latin species name refers to Sphagnum and indicates what environment the species grows in. 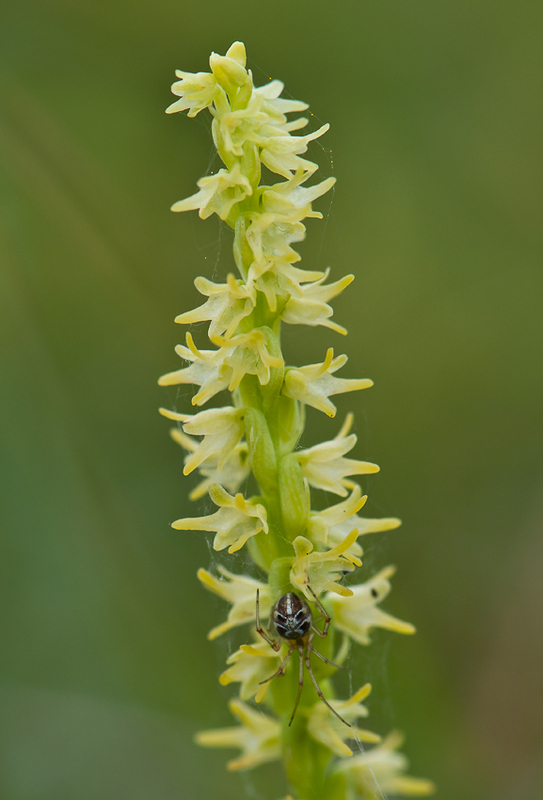 There are not many other orchids to choose from if you can find this key in the marshes and bogs with sphagnum and sundews (perhaps D. maculata subsp. ericetorum). There have always been different opinions about what this species belongs to but for the moment it is placed as a subspecies to D. majalis. Some probably would think that it would better suit in D. incarnata with their unspotted, straight upright leaves. The flowers are pink but much brighter than D. majalis purple flowers. The lip, usually spread out, has darker markings that often consist entirely of fine dots; it is weakly three-lobed or almost entire with just a pointed tip. Habitats are sunny to half shady, wet / moist, acidic bogs, often in sphagnum. 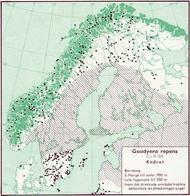 Occurs mainly in Götaland and Svealand outside the limestone areas, but can even be found in Gästrikland / Hälsingland. The distribution is the Atlantic from the French Atlantic coast to Scandinavia. Flowering: June-July. Towards the end of the 1990s there was found some orchids behind the porcelain factory in Lidköping (source, see Note. Jan. 2, 2012). There have since been various suggestions about what species or hybrid this is. 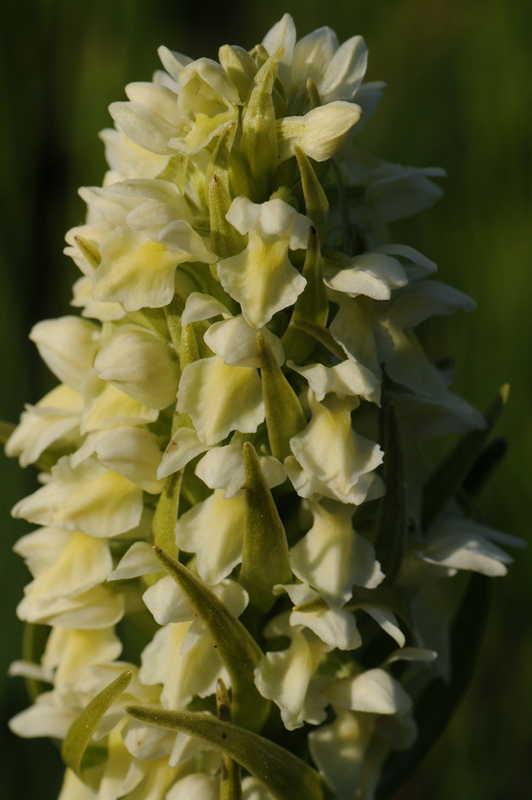 Today, however, most have agreed that it is Dactylorhiza praetermissa. 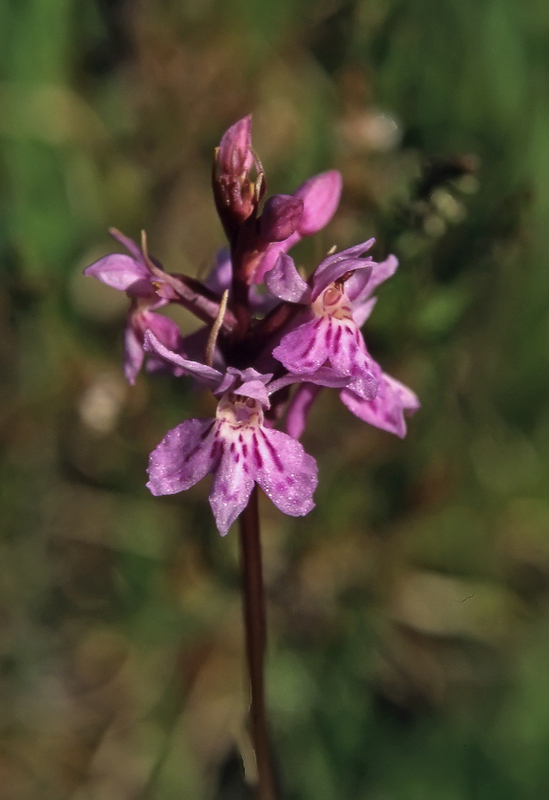 “Englandsnycklar” as this orchid has been named in Swedish (English: Southern Marsh-orchid), has been reported several times from different places but never identified with certainty. In Lidköping this species has, however, become well established and has currently large populations on both sides of the outlet of river Lidan. D. pratermissa are large robust plants, 30-70 cm, sometimes up to 90 cm. The plants in Lidköping have a slightly higher average height than in rest of the distribution area. The leaves are usually described as green without spots but in most parts of the distribution area, specimens with dots and ring-shaped patterns occurs mixed with the usual. However, there is described a variety of D. praetermissa who has spotted leaves, D. praetermissa var. junialis (Verm.) Senghas. The flowers vary from pale pink to red-violet. The lip is flat spread out and weak three-lobed. The rather weak pattern consists of darker dots and streaks, but here differs theplants at Lidköping slightly by that the lip often has a stronger pattern and the loops that you often see at Dactylorhiza species. Plant habitat is usually calcareous meadows and marshes, but also occurs in other moist substrate such as sand dunes and limestone cliffs. The distribution is the northwestern coasts of Europe, England, France, Belgium and Denmark. Flowering: June-July (August). Future DNA studies will tell whether Lidköping plants are good D. pratermissa or not. In 2011, the Danish botanist HA Pedersen presented a document in which he shows that D. praetermissa is a subspecies of D. majalis. According him, the species name "praetermissa" also is incorrect and he gives the species the name Dactylorhiza majalis subsp.integrata (E.G.Camus) H.A.Pedersen. The species are divided into two varieties, where var. integrata corresponding to the main species and var. junialis is those with spotted leaves. 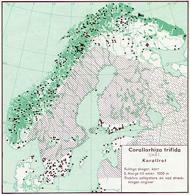 This change has not yet been accepted internationally, but in the Checklist of the Nordic region's vascular plants, “Checklista over Nordens kärlväxter”, which form the basis for the naming of all the Nordic region's vascular plants, this name change is made. The Swedish names for these two taxa have been: var. integrata = “äkta englandnycklar” and var. junialis = “leopardnycklar”. Elder-flowered Orchid, this couple in yellow and red, is familiar to most people. The Swedish name is Adam & Eva. The yellow form is considered the typical and in many places the only one. There are theories that under favorable growing conditions, the red form occur in large quantities and vice versa under worse conditions the yellow form is the only. It is a robust plant with a stubby inflorescent with either reddish-purple or yellow flowers. It is tied to coastal areas in eastern Sweden, but with some single site in Västergötland. In southern Europe, on the other hand, it is a typical mountain plant and can be found up to 2500 m. The total distribution is Europe from central Spain to the Crimea, south to Sicily. Flowering: May to July. Narrow-leaved Marsh-orchid, Swedish name "sumpnycklar", deserves its name, for often it is necessary to have rubber boots if you want to see this close up. This species belongs to a species complex with species that are difficult to distinguish. It has also through time been described a large number of taxa. Many of these have never been accepted but considered as synonyms. Many habitats for this species have disappeared due the extensive draining of wetlands, ​​not only in our country but all over Europe. Some taxonomists believe that Swedish species doesn’t belong to D. traunsteineri which should be limited to the central Alps (Delforge 2005). Instead it should belong to D. curvifolia or possibly D. russowii. D. traunsteineri is a slender plant, up to 40 cm high, with narrow spotted leaves. The rather short inflorescence has quite large, pink / purple flowers. The very weak three lobed lip has darker patterns in forms of streaks and dots. The spur is thick and pointing straight back. Distribution is Öland / Gotland, Väster-/Östergötland up to Jämtland. The total distribution is uncertain due to confusion with related species. Flowering: June-July. The Swedish name for Frog Orchid is “grönyxne” or “grönkulla”. 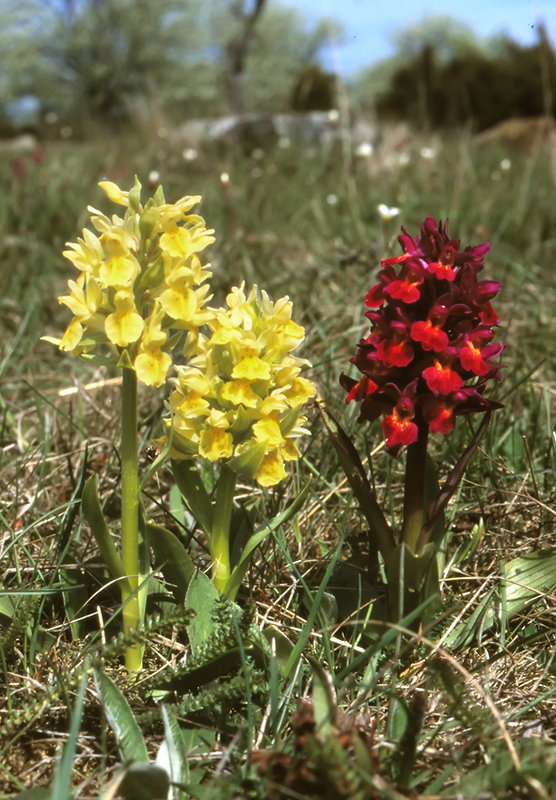 For until just a few year ago it was known as Coeloglossum viride but newer research, using DNA , has shown that it is very close to the genus Dactylorhiza and has therefore been moved to this. This rather small, yellowish-green plant, 8-25 cm, is easy to go by without discovering. The ground rosette has few lanceolate to ovate leaves. The flowers are small, yellowish-green to green with a short; globular spur. In the mountain areas the plants are usually shorter and darker in color, the lip is sometimes almost red. It is generally found on calcareous substrate in mountain meadows and similar grasslands although it is not calcium-dependent. The species is quite common in the Swedish mountain areas and in the eastern provinces, but rare outside these areas. Overall distribution is within the circumboreal areas. Flowering from May to August. Dark-red Helleborine, English name as well as the Swedish name, Purpurknipprot, refers to the color of the flower. Height 15-60 cm. The broad short leavs are often, like the stem, strongly colored red. Flowers are purple-red in a one-sided inflorescence. It has also the Swedish name “vaniljknipprot” because it is said to smell like vanilla. Sometimes you can find plants where most of the red color is missing, and the flower is almost green. Habitats are dry substrates, calcareous stone, gravel or sandy soils. Not uncommon at slag heaps at old mineral mines. E. atrorubens can withstand environments with high mineral levels. E. atrorubens can be found in Götaland (except for the southwestern part), Svealand and Jämtland, even rare in the mountain limestone areas up to Torne Lappmark. Overall distribution is most of Europe, Siberia and Central Asia. Flowering: July to August. Broad-leaved Helleborine would hardly need any introduction. 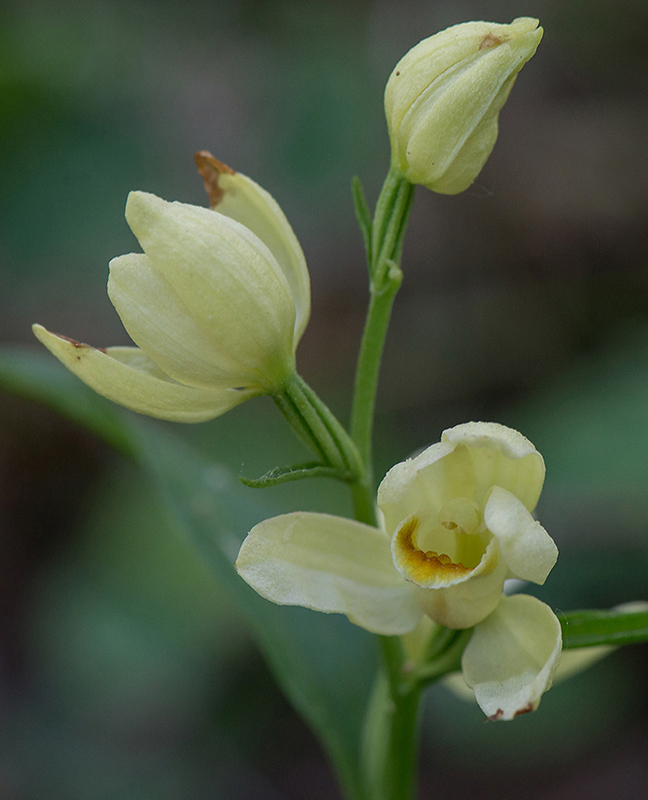 It is our most common "helleborine" with a very large distribution area. The species, which is very variable, reaching a height of 30-90 cm. The cauline leaves are spirally arranged; lanceolate to orbicular. The inflorescence has up to 100 flowers and occupies about a third of the plant's height. The flowers are green on the outside while the inside is brownish / violet but the variation is large. E. helleborine usually grows on calcareous soil in semi-shady to shady areas in sparse coniferous or deciduous forests, rocky areas, roadsides and similar habitats. 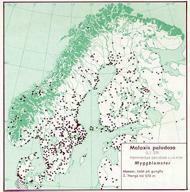 In Sweden it is common north to Jämtland-Medelpad. Total distribution is Europe and Asia. Flowering: July to August. 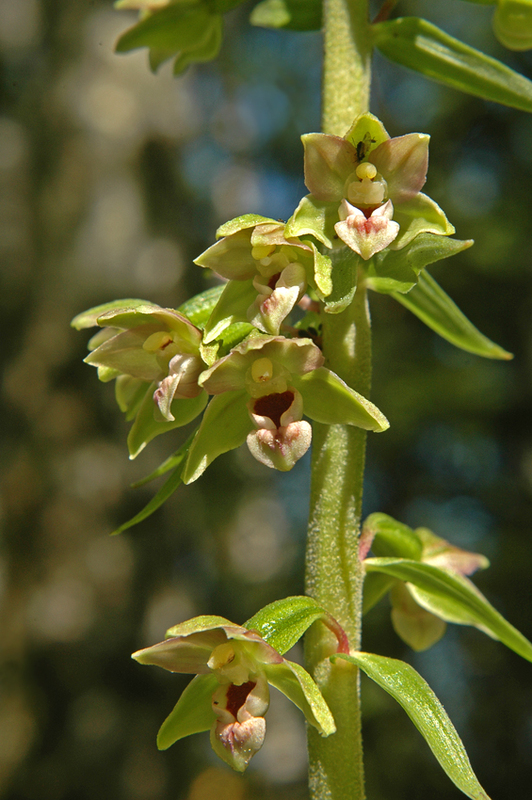 The name Marsh Helleborine as well as the Latin name refers to the growing habitat. It is rather common in limestone areas and you can sometimes see it in the thousands in richer wetlands. It is reaching a height of 30-50 cm and at the top a one-sided inflorescence with up to fifteen flowers. The flowers that hang down are slightly greenish-brown on the outside while the inside is much redder. The most conspicuously part is the large, white, heart-shaped outer part of the lip. This has, towards the center, two yellow bars. Habitat is calcareous fens, wet meadows and other wet environments with lime. This species have decreased due to ditching of wetlands. 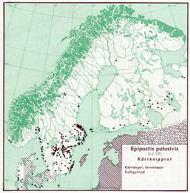 E. palustris occurs in Götaland, Svealand and further north to Jamtland, Ångermanland and Medelpad. Total distribution is central Eurasia. Flowering: July. Green-flowered Helleborine has got its Swedish name “kal knipprot” because the stem is completely without hair. It is a spindly plant, but can reach a hight up to 60 cm, which looks thin and colorless with its sparse, often one-sided ax with green half-closed flowers. The flowers do not open totally and are hanging downward. Several varieties have been described, depending on the form of the flowers. Plant habitat are shaded, calcareous sandy soil in deciduous forests and forest edges. Occurs in Sweden at Öland / Gotland and in Skåne, Småland, southern Halland, Blekinge and Östergötland. Total distribution is the Atlantic coast from Spain / France. Flowering: July to August. Ghost orchid or “skogsfru” as the species is called in Swedish, is known as a mysterious plant. It can suddenly pop up one year and then disappear and not be seen for many years. The reason is that this is a saprophyte that lives underground in symbiosis with a fungus partner and therefore has no chlorophyll, i.e. green leaves. Only when conditions are the right it will flowers and then it "suddenly" is back again. This can be quite a long way from where it flowered last time. The coral-like root forks and old parts die away and in that way it moves underground. The plant grows 5-20 cm high and is whitish pink with just some leaf sheaths around the stem. The flowers (2-5) hanging "upside down". They have the spur and the lip upward and petals/sepals downward. The petals are milky white / off-white, almost transparent, lip and spur has some purple markings. Ghost orchid grows in moist, humus and calcareous rich soil in shady spruce and beech forests, but can also be found in pine and mountains birch forest. Can be found rarely in almost the entire country. Total distribution is the temperate parts of Europe and Asia east to Japan. Flowering: August and September. 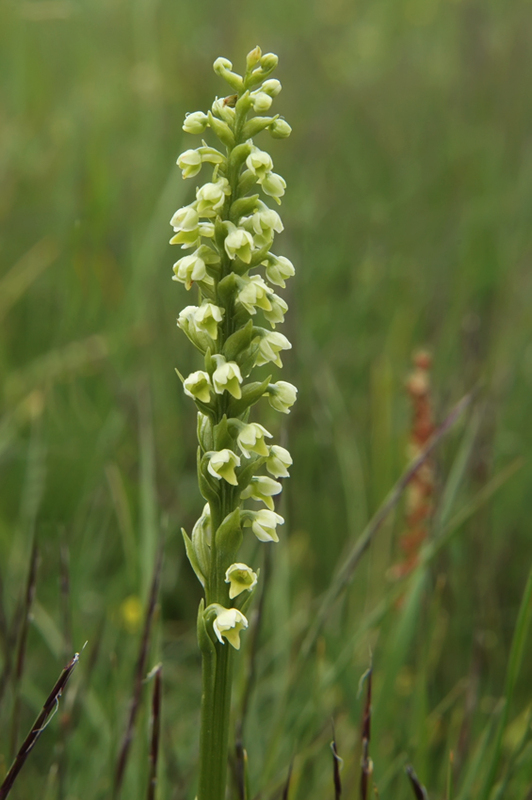 The Latin species name, as well as the English, come from the Latin word for "creep" and refer to the way Creeping Lady’s-tresses grow. From the creeping rhizomes grows side-shoots which bends upwards, forming leaf rosettes. It is also this that has given the Swedish name "knärot" which refer to the knee formed side-shoots that bend upwards. The leaf rosette emerges after flowering and stands green over the winter. The rosette you see at flowering time at the base is last year's growth and will withers when flowering is over. Over time, these numerous side-shoots form real mats. The leaves are beautifully net-veined. The plant reach a high of 10-30 cm and at the top there is a dense inflorescence with flowers often arranged one-sided. The small, white flowers have sepals that are covered fine glandular hairs. Goodyera repens is sometimes called the blueberry pickers orchid since it flowers at the time we normally pick blueberries and grow in the same type of habitat. Goodyera repens are growing in healthy, humus-rich soil in old pine and fir forest, further north, also in birch forest. The species is found throughout the country in forested areas but is more common in the northern part of the country. Total distribution is the northern Europe coniferous areas. Flowering: July to August. Heat Fragrant-orchid is an orchid known from the northern parts of the British Isles. It has now been ranked as a species, G. borealis. Probably this is the same species that are found in the Scandinavian mountains. 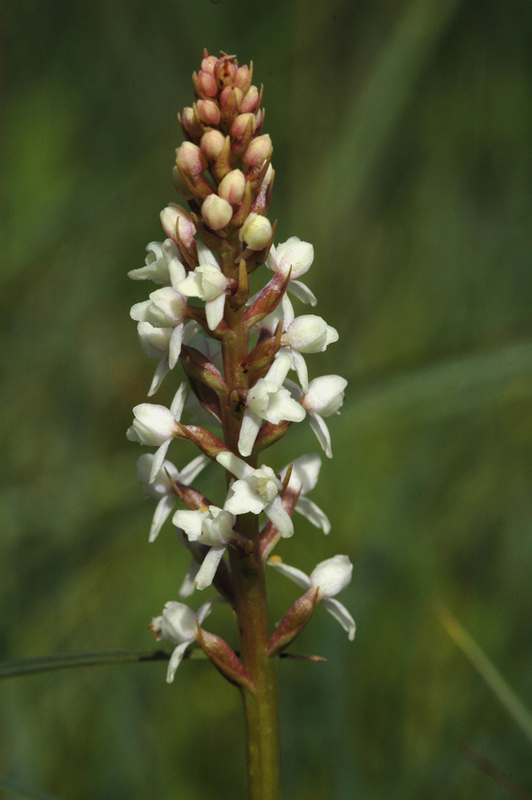 The most of it is similar to the common Fragrant-orchid but has a more compact growth habit. The leaves are usually shorter and inflorescence somewhat shorter. All photos in the gallery are from an island in Nordland, Norway. In these northern coastal areas, the flora is very much like the one you will find in the mountains at this latitude. Flowering: June-July. the species is the thin, downcurved spur that often reaches straight through the inflorescence. Plant habitats are hay fields and other calcareous, open areas as beach and mountain meadows. Due to changed farming and agriculture methods, the species has declined but still you may see it in large amounts in suitable environments. It occurs all over the country. 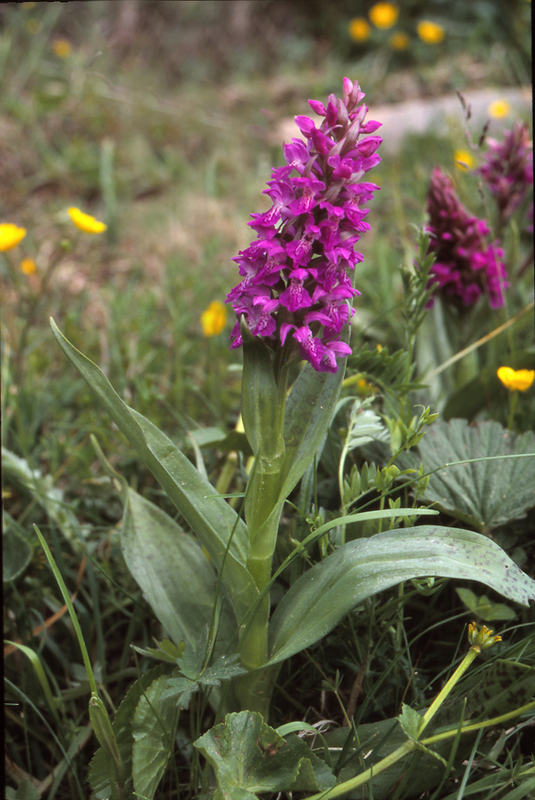 Gymnadenia conopsea belongs to the central and northern parts of Europe, where it is a quit common species. The further south you go the rarer it becomes. Flowering: June-July. 34 Gymnadenia conopsea var. densiflora (Wahlenb.) Hartm. 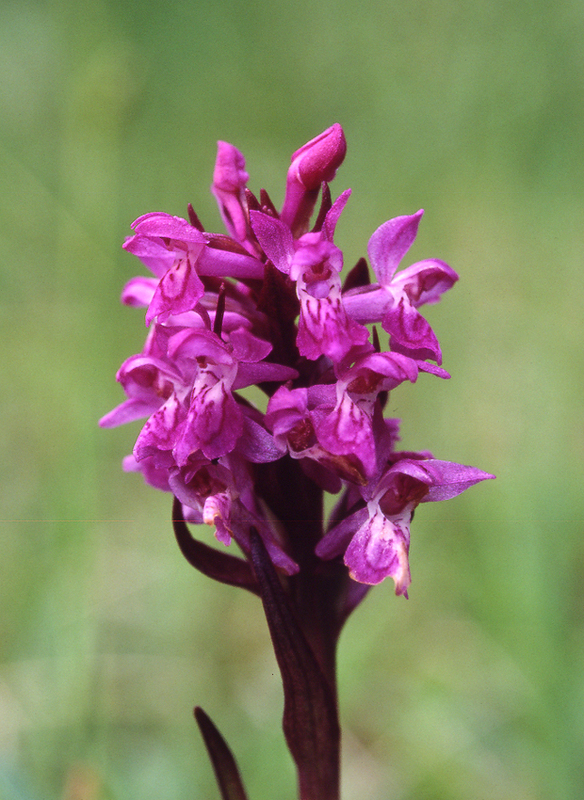 In southern Sweden grows a late flowering and sturdier variant of the Fragrant-orchid, Marsh Fragrant-orchid. In Swedish it is called “praktsporre” and it lives up to that name. It can reach a height of 70 cm and with a dense flower spike that can have up to 150 flowers. The leaves are also much wider and longer than subsp. conopsea. Besides the size and the late flowering time there is almost no differences between this and subsp. conopsea but usually it grows in wetter environments. The distribution is about the same as for subsp. conopsea but in Sweden it does not reach so far north. Flowering: July to August. 35 Gymnadenia nigra (L.) Rchb.f. 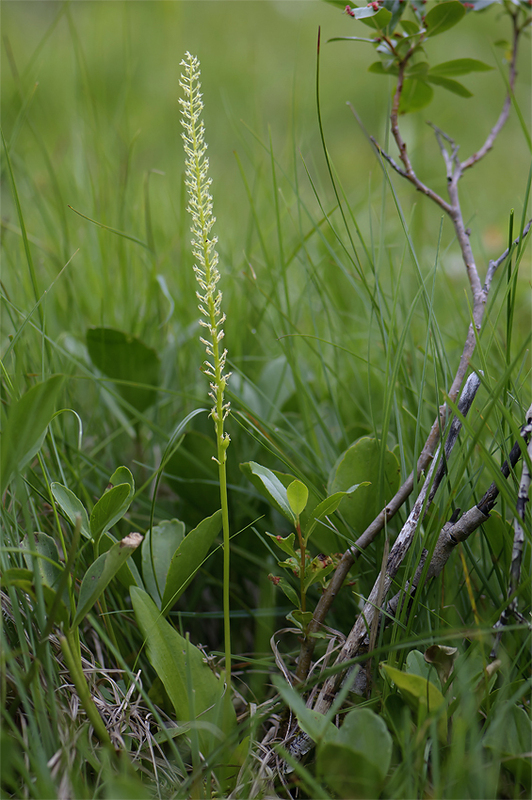 The county flower of Jämtland is the Vanilla orchid. It is a colorful orchid. The Latin species name nigra, which means black, has it received just for the dark inflorescence. 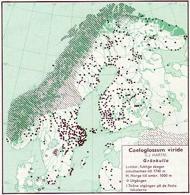 In Sweden it is distributed within the lower mountains limestone areas, but because it is favored by old traditionally agriculture methods it has declined drastically. 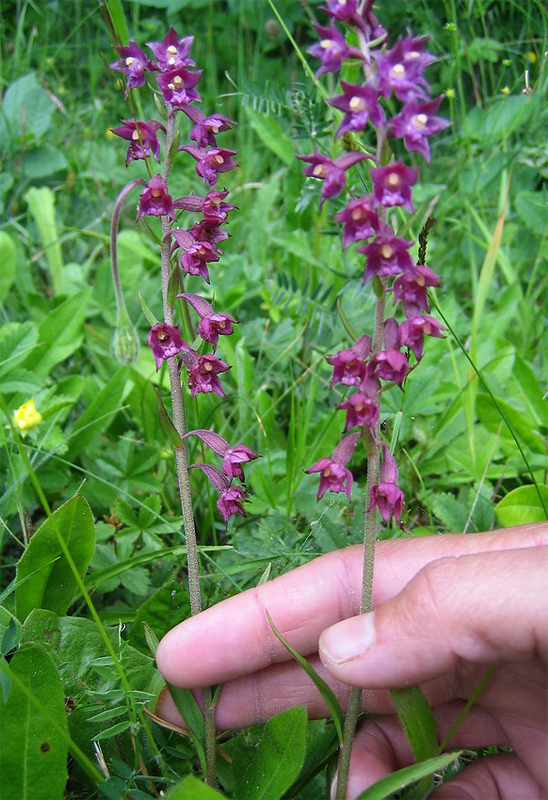 G. nigra is a small orchid, 10-20 cm, with a few narrow leaves at the base and some minor up by the stem. Flowers are densely packed in a nearly globular ax. As the flowers of G. nigra isn’t twisted lip the will remain upwards. All flower segments have the same dark color and are positioned in a star form, the lip is anyhow much wider than the others. Habitats are healthy grasslands, meadows, birch forests and pastures. The Swedish distribution is the central part of Jämtland and some areas of the mountain area of Härjedalen. The total distribution is Northern Scandinavia. It is unclear if G. nigra also can be found in the Alps. Several new species have been described from the European Alpine regions and it is most likely that reports of G. nigra in the Alps are some of this new species. Flowering: June-July. “Luktsporre” or “doftyxne” äre two common Swedish name at this orchid. Both those Swedish as well as the Latin species name suggests that this orchid smells good. This is a much smaller and spindly plant than the much more common G. conopsea. The leaves are very narrow, almost grass alike. Even the flowers are smaller, the color ranges from white to almost purple. The lip is perhaps the surest sign to distinguish it from small-sized plants of G. conopsea. It is almost entire or weakly three-lobed, the center lob is clearly longer. The spur is also shorter, about as long as the ovary. Habitats are calcareous soils as fens, bogs and flood irrigation beds. In Sweden it can be found at Gotland and in some areas in west and east Götaland. Total distribution is central Europe, southward to the Alps. Flowering: July. 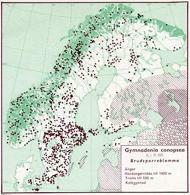 In 1961 the botanist Olof Rune found a new orchid species for Sweden, Gymnadenia runei or “brudkullan” which is the Swedish name. 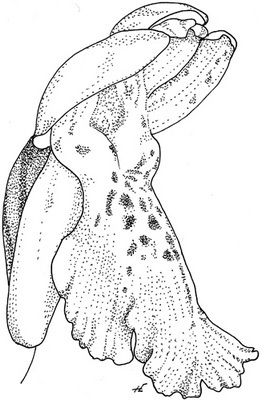 It was considered from the beginning to be a hybrid between G. conopsea and G. nigra. But now it is accepted as a separate species even though it has a hybrid origin. The Latin species name, runei, it has received in honor of the botanist who found it. It resembles G. nigra and this is probably the reason for that it had not been previously detected. G. runei is usually slightly shorter than G. nigra, the flowers are little lighter, slightly more open, and have a slightly shorter spur. Grows on a few sites within Åsele and Lycksele Lapmark. Endemic. Flowering: July. The genus Hammarbya is named after Linnaeus's residence outside Uppsala, Hammarby. It is a monospecific genus with this species as the only one. However, there are botanists who claim that the species should belong to the large genus Malaxis, with over 300 species, mostly tropical. Hammarbya is one of our smallest orchids, only 3-15 cm. You must look carefully to get sight of it in all other vegetation. At the base there is usually a pair of yellow-green, oval leaves. Viewing carefully, you often can see small sprouts at the leaf margins, a way of vegetative reproducing. Even the flowers belong to the smaller among orchids,only 3-5 mm. The pale yellowish green flowers occupy nearly half of the needle-thin stems. A peculiarity that these have is that the relatively long ovary turns one full turn which means that the lip end upward again. Habitat is poor fen and quaking bog, usually in mats of sphagnum. In Sweden the species can be found from Skåne to Lule Lapmark but ewerywhere quite rare. Total distribution is circumpolar in the temperate zon. Flowering: July to August. Musk Orchid has gets its Swedish name, “Honungsblomster”, for the scent who are said to smell like honey. It is a small plant that can reach a height of 25 cm, but usually not more than 10 or less than that. The Latin species name refers to the fact that it has just one root tuber. After flowering it produce two or more new tubers which are borne at the tip of slender stolons, up to 20 cm long. At that way the orchid is moving quite quickly. The small, yellow-green, bell-like flowers are sitting in a sparse cluster. The lip is three lobed with mid lobe much longer than the side lobs. Also the other petals have extended tips which give the flower a sprawling appearance. Habitat is tufted, calcareous wetlands, pastures and other low-growing grasslands. The species is found on the island of Öland, Gotland, in Västerbotten and Östergötland, otherwise there are few sites in central Sweden. Total distribution is Europe and the temperate regions of Asia, east to Japan. Flowering time: June-July. Fen Orchid has two common Swedish name, "gulyxne" and "myggnycklar". It is a small inconspicuous plant. Totally green, possibly with little yellow-green in the sprawling flowers. At the base there are two tongue-like, erect leaves. The flower stalk is quite short compared to the leaves and has 1-10 centimeter big, bright yellow-green flowers in the top. The ovary do a complete turns which make the lip stand upward again. Other petals are very narrow and give the flower a sprawling appearance. L. loeselii is a very rare orchid and only grows on calcareous wet surfaces as in calcareous fens and similar areas with short vegetation. Mostly in coastal areas. In Sweden it can be found on Öland and Gotland and on the mainland from Skåne through Östergötland, Södermanland, Uppland and southern Gästrikland. Total distribution is the most of Europe but not in the far north and far south. Flowering time: June-July. Single-leaved bog orchid is perhaps an appropriate name for this orchid. Even the Latin name monophyllos means "one leaf" and refers to the plant has only one leaf. There are discussions about whether this one and only European species should be considered as belonging to the genus Malaxis or Microstylis which has been the standard in the past. 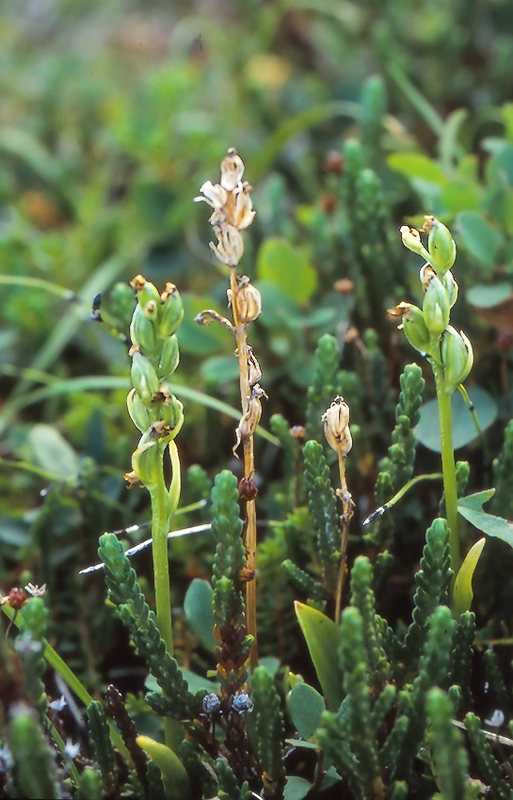 All previously species belonging to Microstylis is now transferred to Malaxis and in recent literature the family name Malaxis is used even for the European species. Flower stalk can be almost fifty centimeters, although usually much shorter. The flowers (30-60) are not more than 4-5 mm in size and completely green. Even in this species ovary is twisted 360 degrees and turn the lip upwards again. 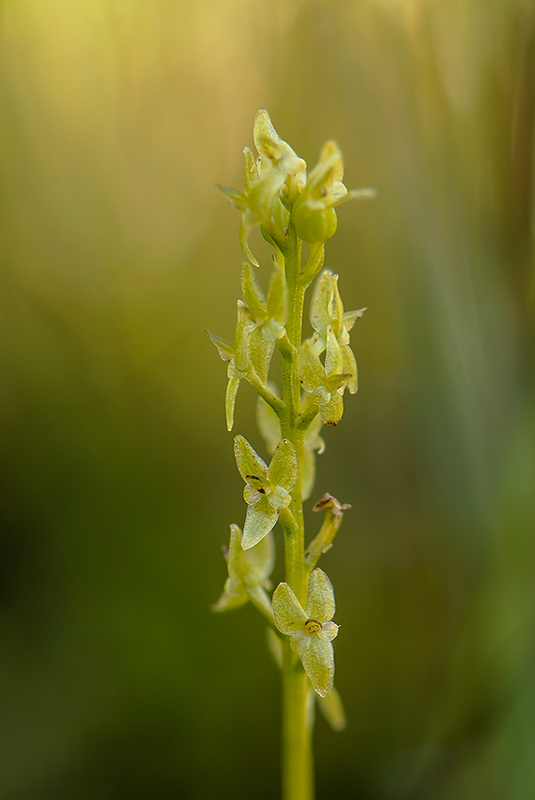 This orchid is almost "impossible" to find, totally green as it is and with the thin, sheer inflorescence it disappears in all other vegetation. M. monophyllos is very rare and grows only in calcareous damp forest and meadows, calcareous fens or similar areas. 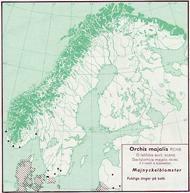 In Sweden it can be found in the middle of the country, from northern Götaland to Jämtland / Medelpad (coast of Norrbotten). Total distribution is parts of northern, central and eastern Europe. Flowering time: June-July. Burnt Orchid is the only species from the genus Neoti-nea represented in the Nordic region. It's recently moved to this genus. 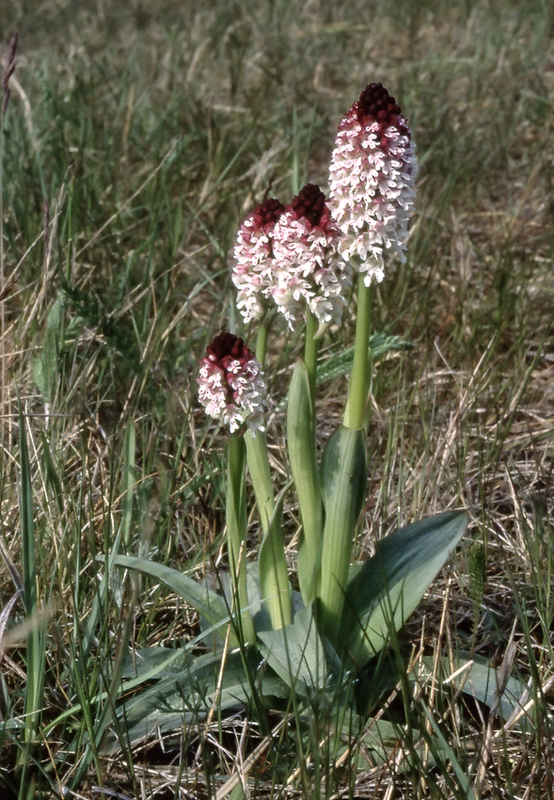 Previously it was named Orchis ustulata but with DNA technology it is proven that it is closer to the species in Neotinea than to Orchis species. It is a rather small species, height 10-20 cm. At the base there are some grayish-green leaves and in the top a rather short but dense inflorescence. The buds are dark red, almost black, while the open flower is dominated by the white lip, which have small, red spots. This make the inflorescence to look as it was burnt at the top which has given it the Swedish name as well as the English name. Habitat is usually calcareous dry and sunny grassland. In Sweden it is found at Öland and Gotland and at a few sites in southernmost Swedish mainland. 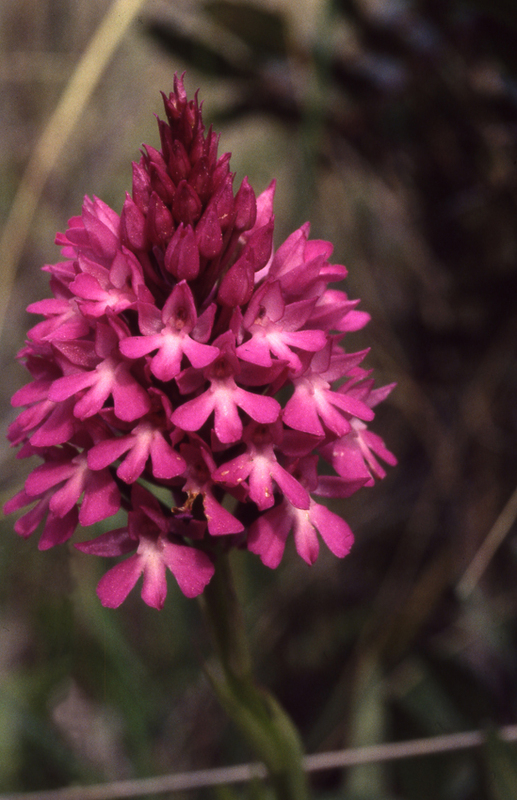 In southern Europe, Burnt Orchid is a mountain plant and lacking in coastal areas. Flowering time: June.. 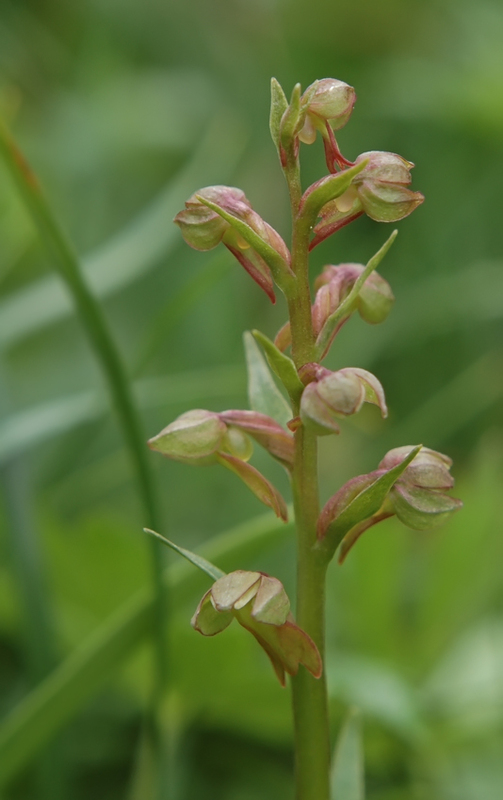 Lesser Twayblade is well known in Sweden. With a height of 5-15 cm and spindly spike it is however difficult to see among all other vegetation. The leaves are small and heart-shaped and sit opposite each other in the middle of the stem. The flowers (3-10) are small and purple green and sits in a short, sparse spike at the top. The lip is deeply forked with pointed, outward curved lobs. The other petals are quite narrow and stands right out and gives the flower a star shape. Grows in damp shady woodland. Found throughout Sweden but most common in the north, rare in the south. The distribution is circumpolar, through central and northern Europe, Asia and North America. Flowering time: May-August. This species has, until recently, being named as Listeria cordata but after recent DNA research it is found that this species is closely related to Neottia and therefore transferred to this genus. 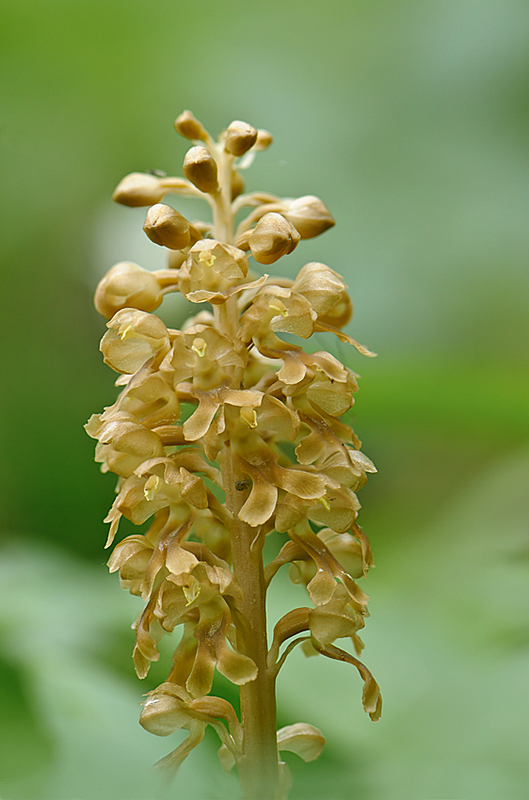 The English name, Bird's Nest Orchid, just as the Swedish name "nästrot" refers to the root system that looks like a bird's nest. Even nidus-avis meaning bird's nest and refers to the richly branched rhizome. Although the species has little, barely visible chlorophyll, it is entirely dependent on their fungal partners for nutrition and is therefore classified as a saprophyte. The height of this completely brown plant is usually 15-35 cm. It has no leaves just a few brown sheaths around the base. The inflorescence consists of a large number of yellow-brown centimeter-sized flowers. Plant habitat is shady, moist birch or pine forests in alkaline to neutral ground. The color of the plant makes it not that easy to find since it can be taken for something withered from last year. Can be found up to Jämtland / Ångermanland. Total distribution is Europe and Asia as far east as Japan. Flowering time: May-July. 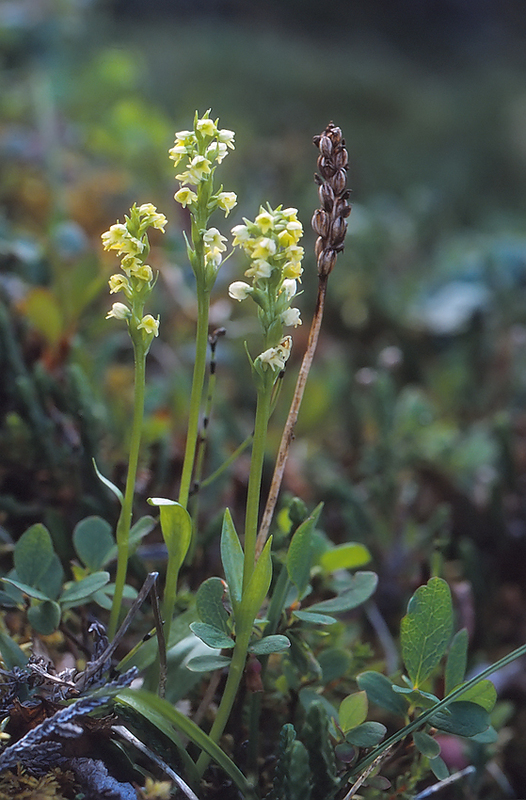 Twayblade in Sweden is one of the most common orchids. Quite unimpressive with its small green flowers even if the height can reach 75 cm. 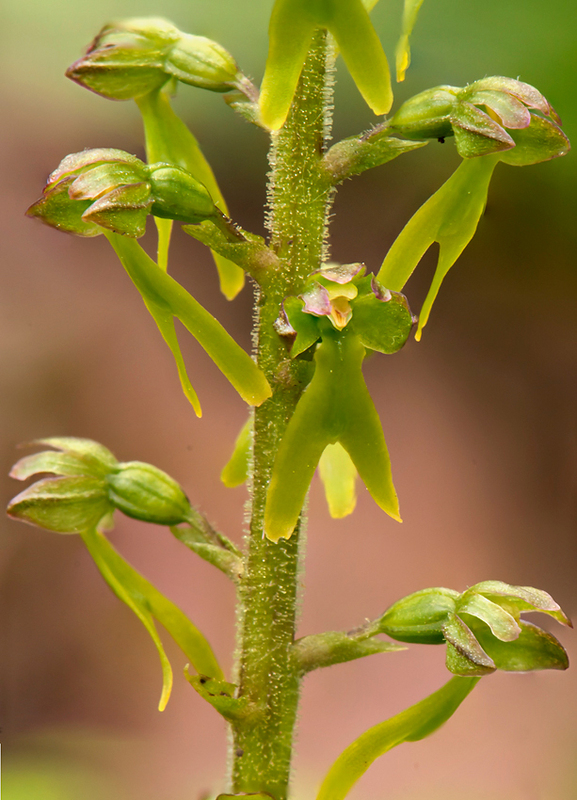 The name twayblade derived from the two large oval leaves sitting across each other at the base of the stalk. The upper half of the stem forms a long, sparse inflorescence. The flowers are yellowish-green with a rather long, divided at tip into two long lobes. This is an orchid that can be found on almost any substrates, preferably in groves and meadows but also in coniferous forest. In the mountain areas it goes up to 2400 m. Can be found in the whole of Sweden up to southern Lapland. Total distribution is as good as all Europe. Flowering time: May-June. This species has, until recently, being named as Listeria ovata but after recent DNA research it is found that this species is closely related to Neottia and therefore transferred to this genus. 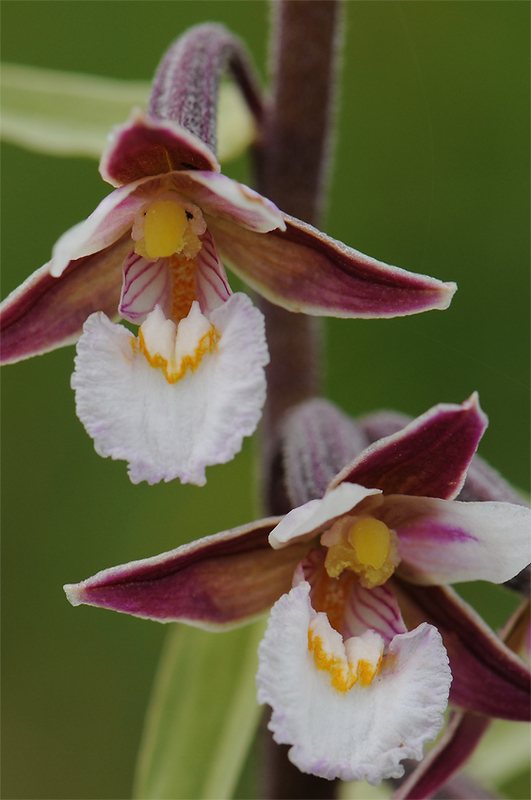 Ophrys is by far the largest orchid genus in Europe. In Sweden, there is only one species, the fly orchid, but there is hardly any of all these Ophrys species that better mimics a fly than our fly orchid. It's not just wasps, which pollinate those, who can make mistakes but also to our human eye, it may look like flies that are lined up on a straw. Fly orchid has a rosette with 3-5 almost erect leaves at the base. 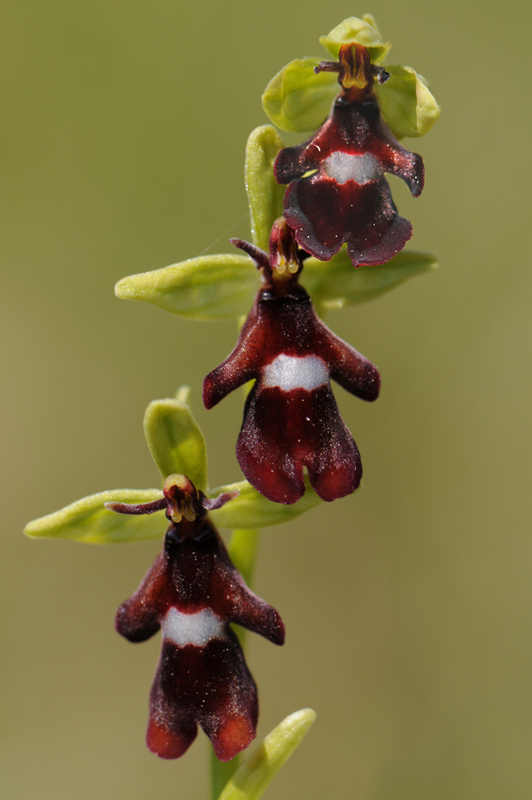 The flowers are unique and look like insects with the lip as body and petals formed into narrow ribs, as antennas. The dominant lip is brown with a blue / white band across, the sepals are green. 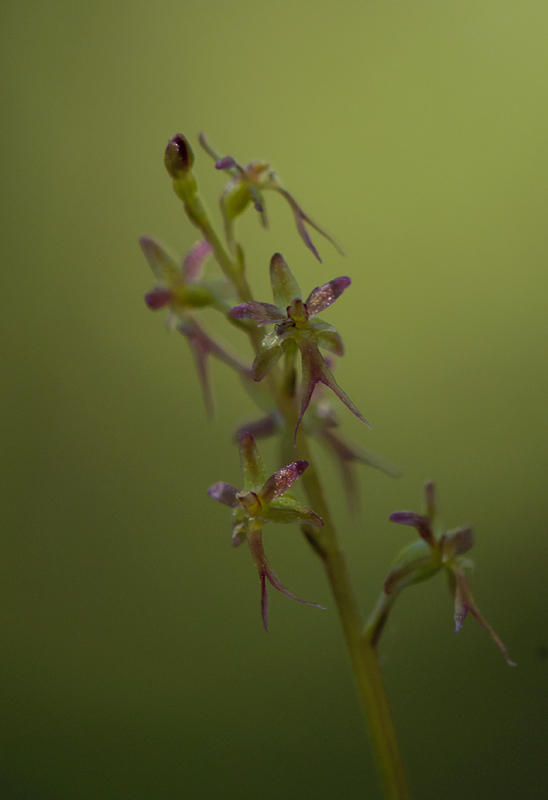 Fly orchid can be found in Sweden in lime areas from Skåne to Jämtland. Flowering time: June-July. 47 Orchis mascula subsp. mascula (L.) L.
Early Purple Orchid is known from many of our country's limestone areas. Often you can see large colonies of this colorful orchid. At the base there are a number of green leaves, sometimes with brownish-red spots. A few sheets ensheath the lower part of the stem. 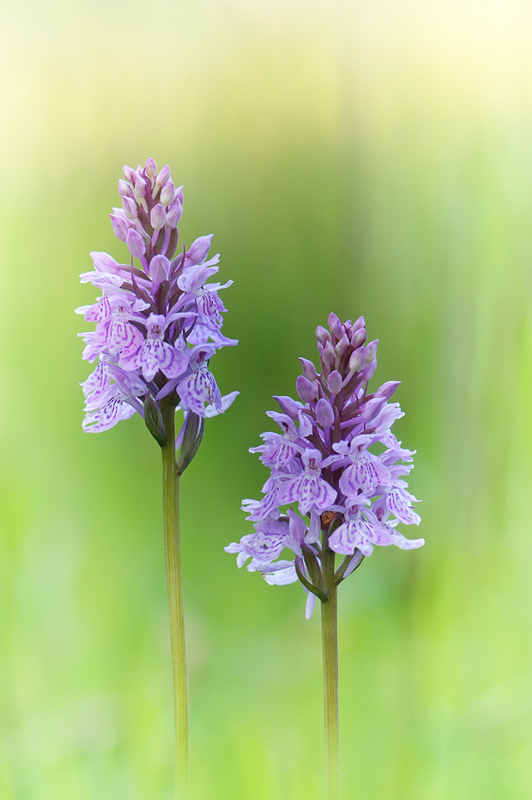 This is typical for Orchis, and can be a way for the inexperienced to differentiate Orchis and Dactylorhiza. The flowers are quite large in a long, narrow inflorescence, the color is usually pale to dark purple but the color can vary greatly. The lip has a white central part with red spots. Early purple orchid has often a scent reminiscent of cat urine. The species base-rich, fairly dry soil but grows otherwise in many different environments, meadows, hills, groves, woods and also on culture-affected sites. In Sweden subsp. 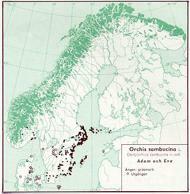 mascula is found I the southern part, on Öland / Gotland and in Götaland and Svealand’s limestone areas. It has a very wide range, from the Arctic Circle to the Mediterranean. Several subspecies have been described, some of these as separate species. This makes the distribution area of ​​O. mascula subsp. mascula somewhat unclear because of confusion with these species / subspecies, especially in the south and eastern part of its distribution area. Flowering time: May-June. Military Orchid is a stately robust orchid. At the base there is a rosette of wide, large leaves. The infloresencense in the top of the green stalk is dense and initially conical but becomes cylindrical when buds open. The petals form a helmet over the pillar. The helmet is gray-white tinged of purple, while the inside is streaked. 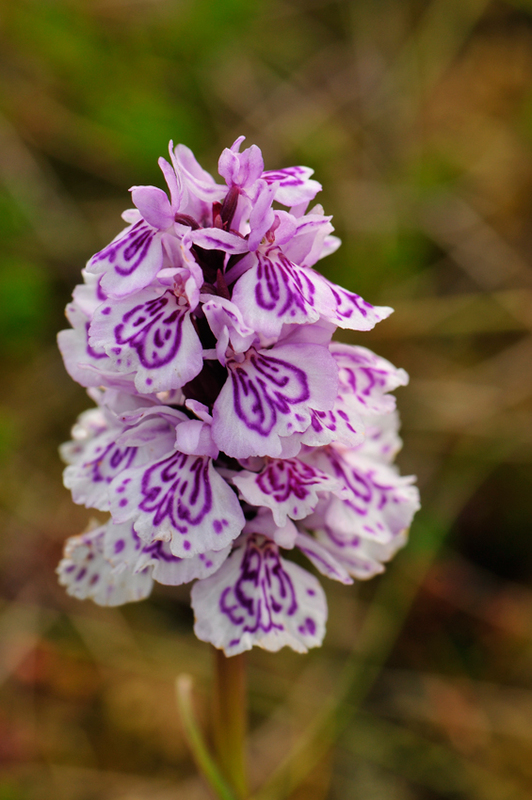 Military Orchid belongs to a group within Orchis where the lip has a human-like form. The lip is three-lobed with two thin side lobes, which form the "arms" on the “man", center lobe is much larger forming the body and the tip is divided into two small lobes and forming the legs. Middle part is white / light pink, while the lobes are purple. Habitata are calcareous meadows, pastures, roadsides and forest edges. 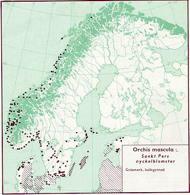 In Sweden it is primarily found on Öland and Gotland and with some single sites in northeast Skåne, Blekinge and Upland. Total distribution is most of Europe but rare in the Mediterranean areas. Flowering time: June. 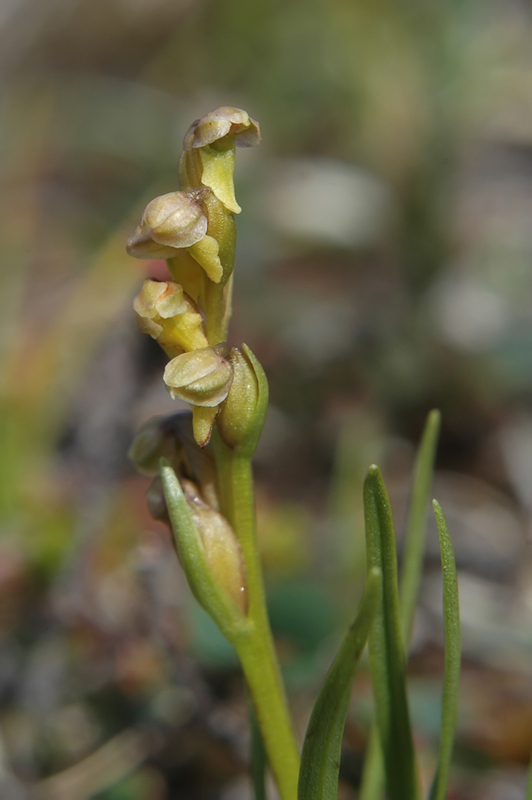 Spitzel's Orchid has got its Swedish name, "alpnycklar", from the area where this species normally grows, in the Alps. The strange thing is that it is a very long distance from the nearest population to the occurrence on Gotland. How this has happened, no one knows for sure. Spitzel's Orchid is 15-30 cm high; leaf rosette at the base has no dots. Flower stem has a narrow and rather sparse inflorescence. The flowers are pale red, the lip hang almost straight down and have small darker spots. The spur is thick and directed obliquely downward. Other petals are forward facing, with brownish outside. 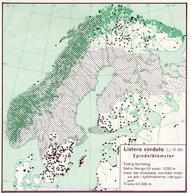 Habitats are dry calcareous soils as rocky pine forests, beachside pine forests on Gotland. Total distribution is Europe's mountain areas, from the Pyrenees to Turkey's mountainous areas in the east. Flowering time: June. 50 Platanthera bifolia (L.) Rchb. Lesser Butterfly Orchid is one of the most common orchids in Sweden It is growing in many different environments. Although it benefits of lime, it is not calcium-dependent, and can therefore be found outside our limestone areas. However, it has become increasingly rare when the old farming methods changed. The species name, bifolia, means two leaves, indicating that it has only two leaves at the base. Flower stem is up to 30 cm and has a long inflorescence with sprawling, yellow-white flowers. The nectar-filled spur is up to 2.3 cm and is a character that separates it from subsp. latiflora which has a longer spur, it can be more than 4 cm. Another character that differs from chlorantha is the position of the pollinium. At bifolia these are parallel and almost cover the entrance to the spur while at clorantha the pollinium are spaced apart and forms an inverted "V" and therefore leaving spur mouth fully open. 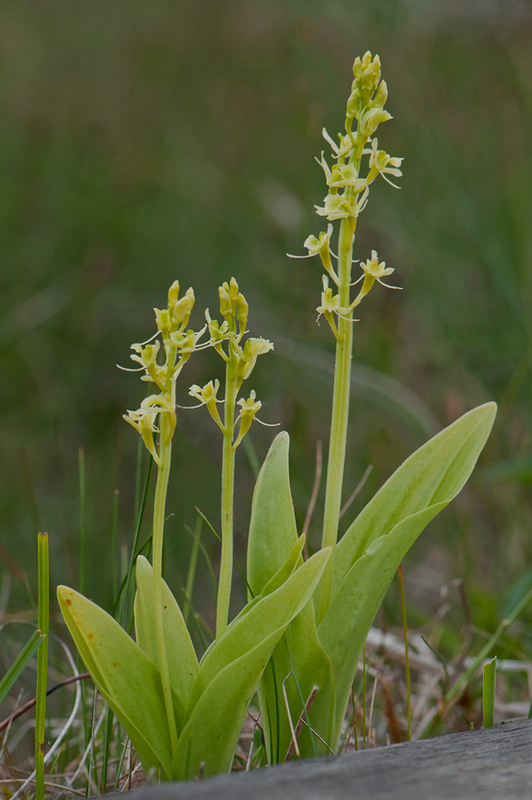 Lesser Butterfly Orchid can be found to the south of Lapland. Total distribution is Europe and eastward into central Siberia, unusual in the southern parts. Flowering time: June-July. Subspecies latifolia is not often mentioned. The species is often confused with P. bifolia subsp. bifolia. It has slightly larger flowers than subsp. bifolia and the inflorescence is little more lax. The easiest way to see the difference is perhaps on the spur, because it is usually more than a centimeter longer, up to 41 mm. Habitats are nutritious woodland which also separates it from subsp. bifolia which usually grows in open fields. Total distribution is poorly understood because of confusion with the main species but probably it is fairly common. Flowering time: June-July. 52 Platanthera clorantha (Custer) Rchb. 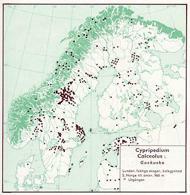 Greater Butterfly Orchid has at many areas in Sweden become more common while bifolia has decreased. This is due partly to that chlorantha can better tolerate overgrowing and has therefore, to some extent, benefited from the newer agricultural methods. P. chlorantha and bifolia are very similar but the former is usually larger and more robust. Also this one has the typical two leaves at the base. Flower stem can in favorable conditions reach a height of 60 cm. Even the flowers are larger than those at bifolia and greenish, which has given it the Swedish name, "grönvit nattviol". The pollinia at chlorantha are spaced apart and form an inverted V, while at bifolia they are parallel and close together. This is a sure character to separate these two species. 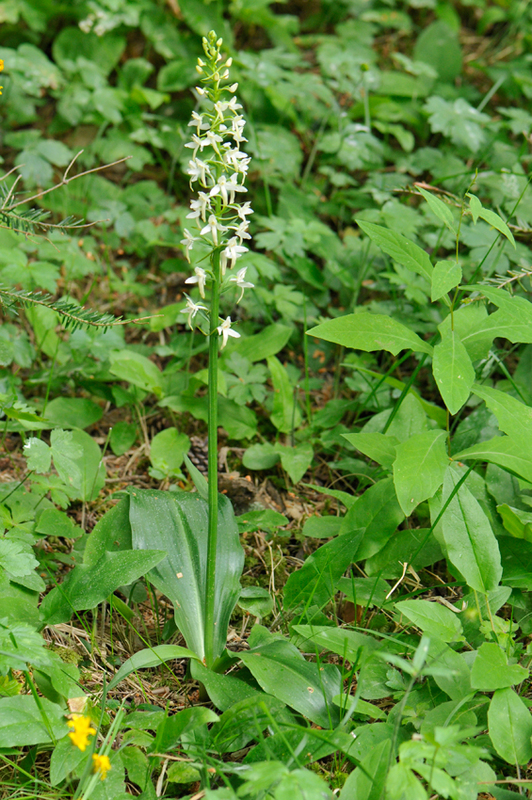 Greater Butterfly Orchid grows in moist, nutrient-rich deciduous woodland, groves and pastures. Prefer usually shadier locations than Lesser Butterfly. Distribution is Öland, Gotland, southern and central Sweden, as well as some sites in Jämtland / Ångermanland. Total distribution is Atlantic / Mediterranean. Flowering time: June-July. Small White Orchid has in Sweden, as in most European country, disappeared in large parts of the country, only in mountain areas you can find it more commonly. It is a small plant, height 15-30 cm, with a rather short inflorescence with many small yellow-white flowers. The bell-shaped flowers are only half open and only the lip sticks out. The lip is three-lobed and at subsp. albida the middle lobe is longer than the side lobes. The spur is short and swollen and the species is in some places in Sweden called "club spur". The species does not need calcium rich soil but have benefited from the old farming methods. In the southern part of the country, where modern agriculture methods dominates, it is almost entirely disappeared. Only in sub-alpine areas, where the natural habitat for this species is present, it is common. 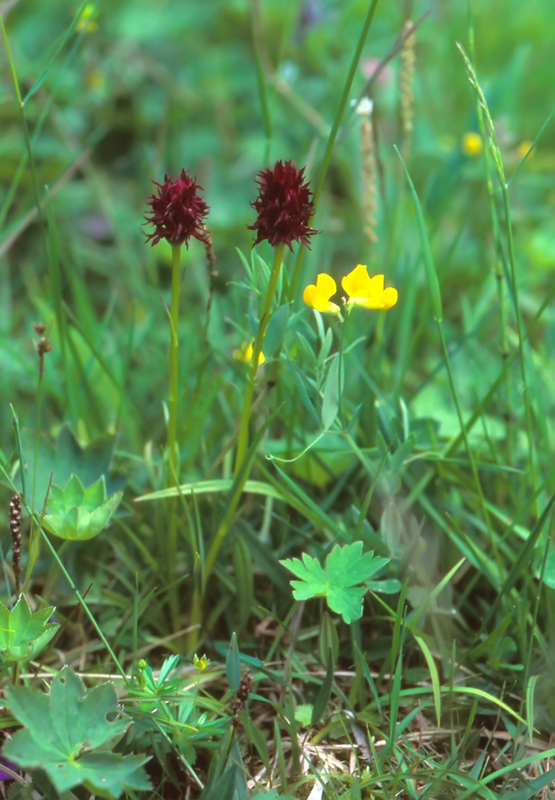 It grows on poor meadows and grasslands, alpine meadows and similar environments. Flowering time: June-July. 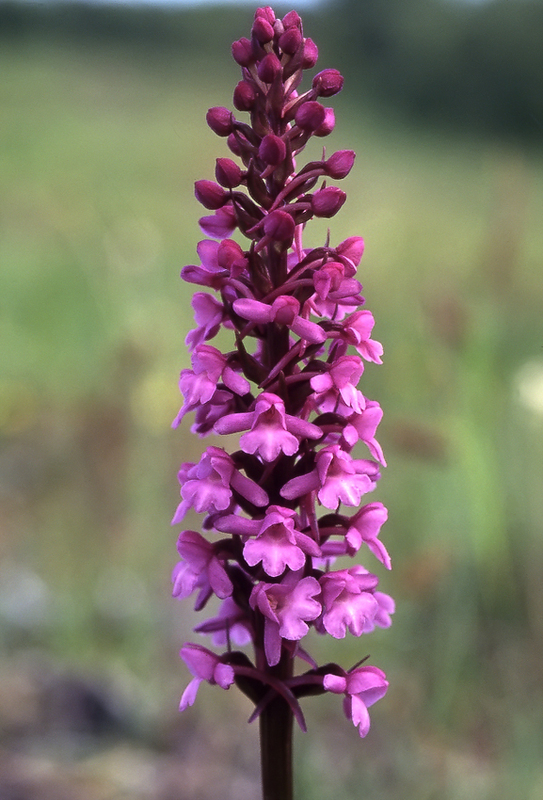 Sometimes it is referred to this genus as Leucorchis, and in other literature Pseudorchis albida has been transferred to Gymnadenia (Delforge 2005). 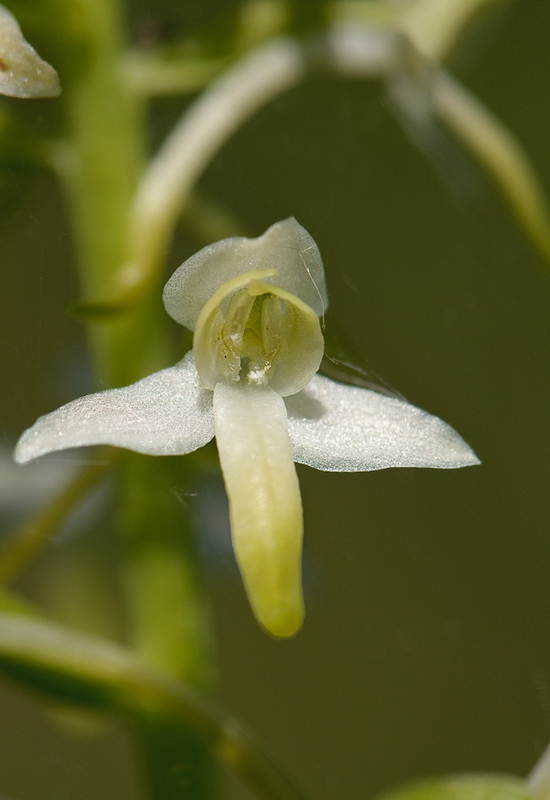 This subspecies of the Small White Orchid received the Swedish name "fjällvityxne" because it is only in the mountain areas, you can find it. It is very similar to subsp. albida but the flowers are larger and have a more yellowish color. All lobes of the lip are here about as long. Found on dry calcareous grasslands and heaths from Härjedalen to Torne Lapmark. Total distribution is the subarctic areas of the Northern Hemisphere, Canada, Greenland, Faroe Islands and northern Scandinavia. Flowering time: July-August. Distribution map to the right shows the distribution of both subspecies. 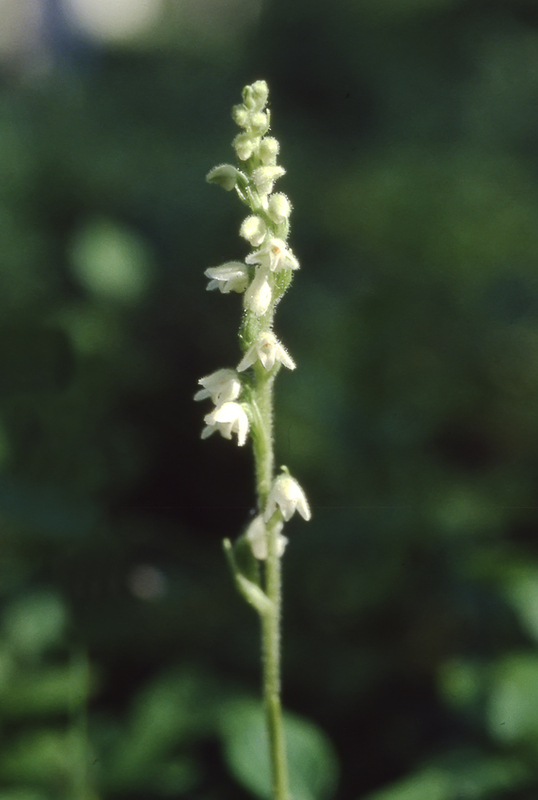 56 Spiranthes spiralis (L.) Chevall. 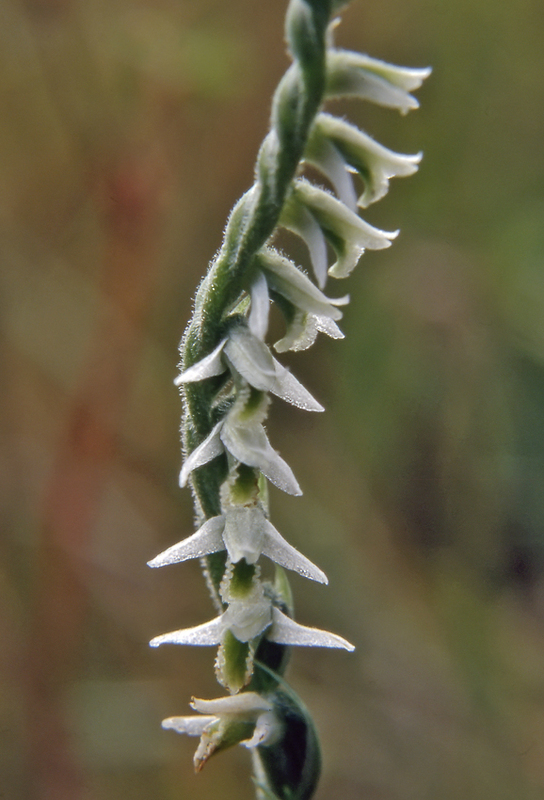 Autumn Lady's Tresses is the orchid that flowers latest of all our orchids. It is only known from a small area on the island of Öland. It is a small, tender plant, no more than 10-15 cm high. At its base there is a rosette of leaves with 2-3 cm large, ovate leaves. These wither after flowering and new shoots grow during the fall and remains green during the winter. That's why it is last year's growth that you can see during the flowering time. Inflorescence has given it the Latin name “spiralis” (as well as bouth the English and the Swedish) because the small, white flowers (3-4 mm) are sitting in a spiral shape around the stem. The Spiranthes spiralis at Öland are planted there (1969) but the species has established itself well and today it is counted as belonging to our flora. 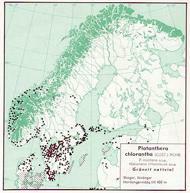 The nearest natural occurrence is (was) in Denmark where it now probably is disappeared. In many of the European country the species has been heavily influenced by agriculture changed farming methods. Usually it grows in low-growing grasslands. Total distribution is Atlantic-Mediterranean; eastward to Iran. Flowering time: August to September. Karta från "Den virtuella floran"